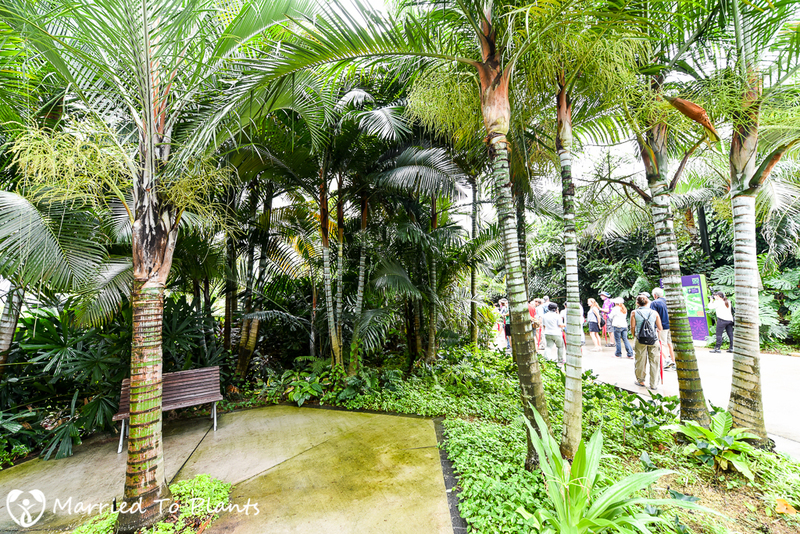 As part of the second leg of the International Palm Society’s biennial group trip, Singapore was the next stop after Sarawak, Borneo. 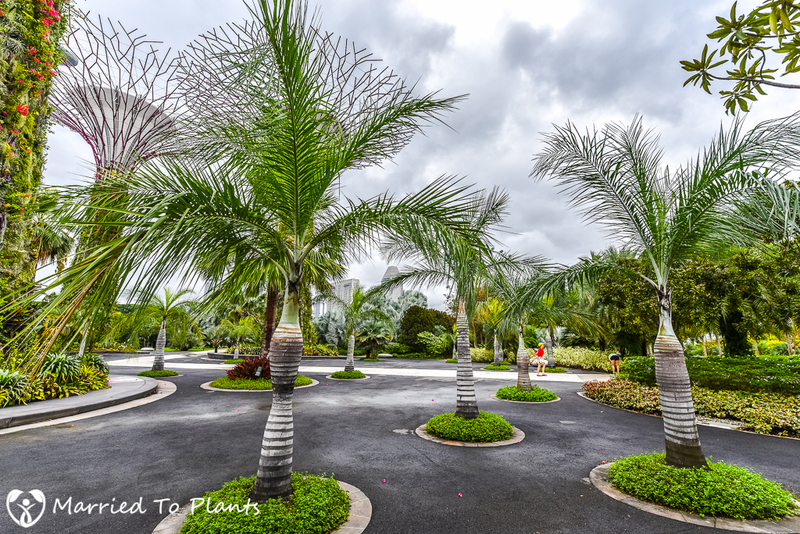 The IPS had planned three palmy locations to visit while we were in Singapore. 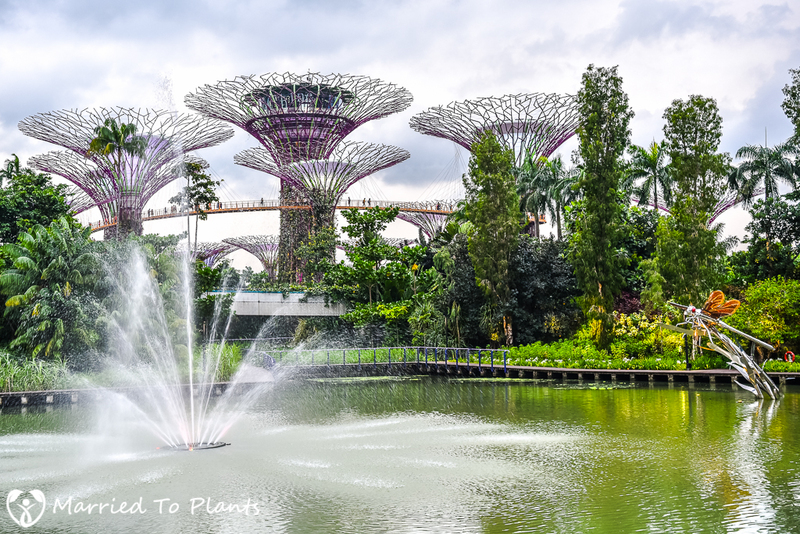 Gardens by the Bay, Singapore Botanic Garden (topic of next week’s post) and McRitchie Reservoir. 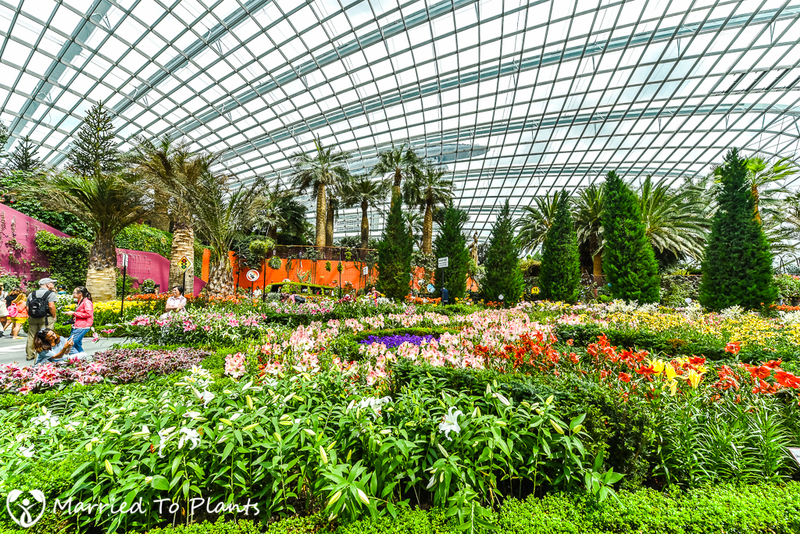 Gardens by the Bay was first up. Before I begin the tour, I would first like to apologize. 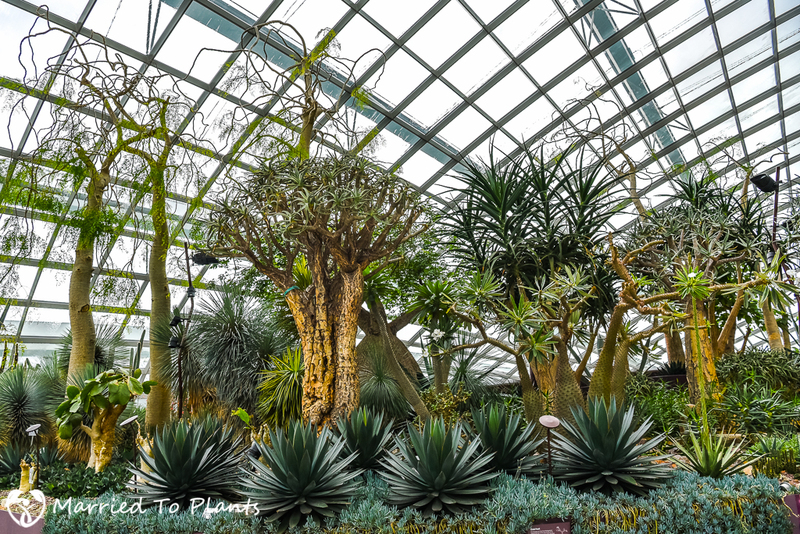 There was only so much I could capture and share from half a day at a place as grand as Gardens by the Bay. 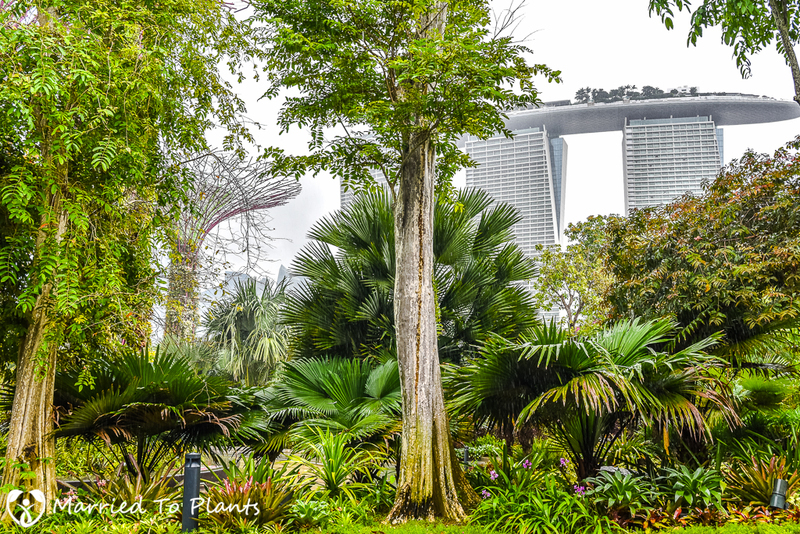 I knew once I saw Gardens by the Bay from the 45th floor of my hotel rom at the Marina Bay Sands that I wouldn’t be able see it all within the time allotment I had. So the tour I am posting today can only be looked at as a general view. So much was missed that I hope to return again someday. 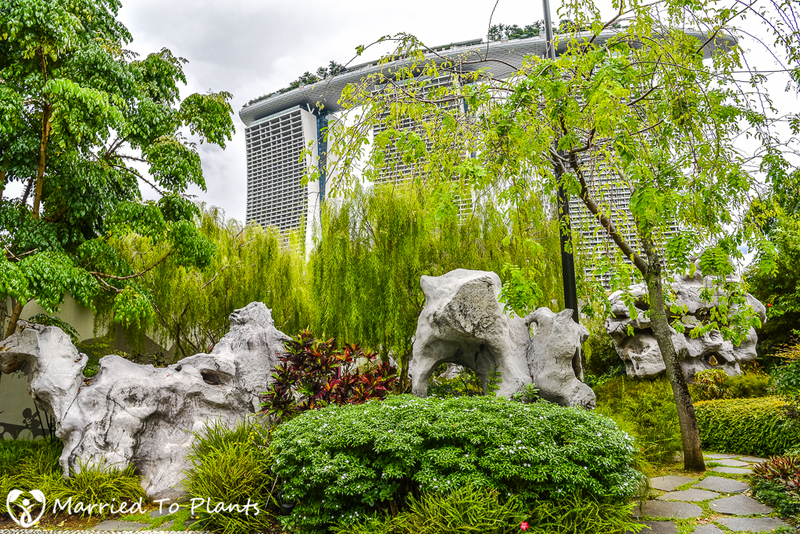 So a little bit about Gardens by the Bay before I start the tour. 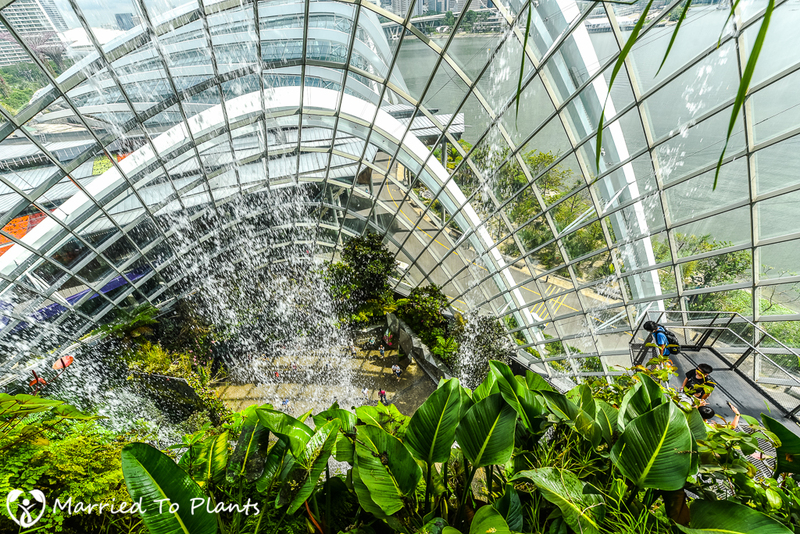 Taking a few million visitors a years, Gardens by the Bay is actually a 250-acre national park that resides on reclaimed land in Singapore. 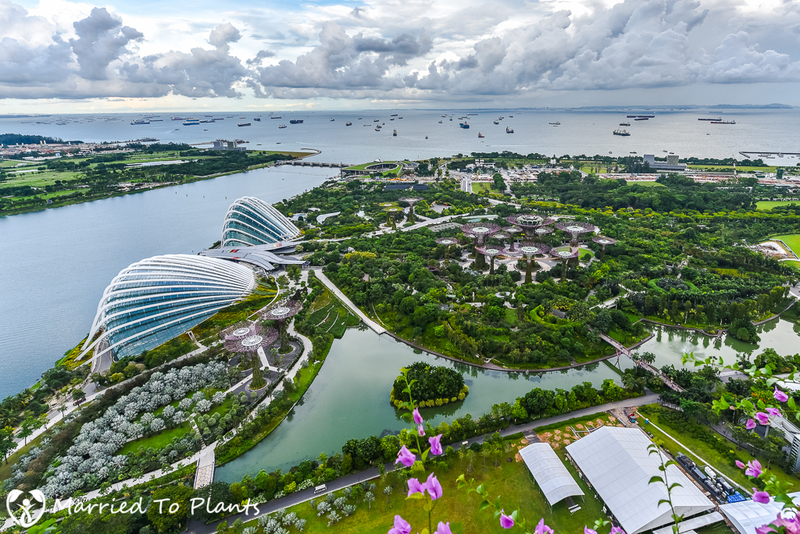 Gardens by the Bay consists of three waterfront gardens: Bay East Garden, Bay Central Gardena and Bay South Garden, the largest at 130 acres, which is shown in the photo above. 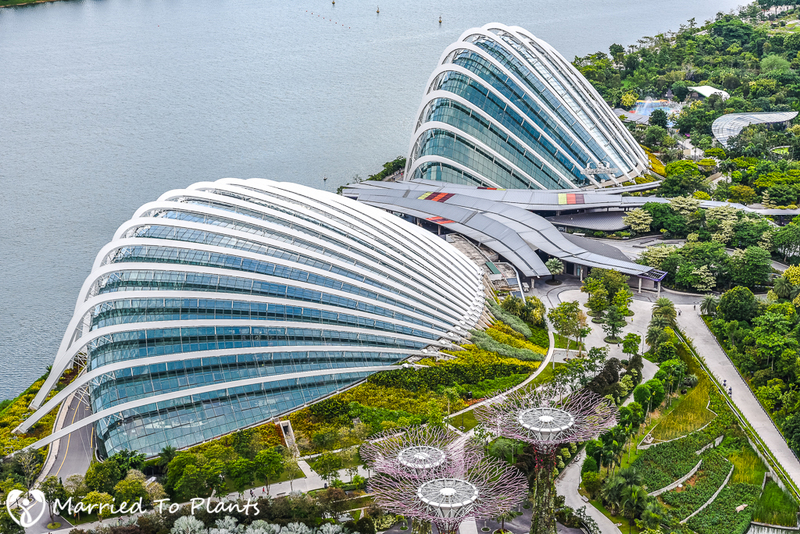 With a budget of over 1 billion Singapore dollars (around 750 million USD), Gardens by the Bay broke ground in November 2007 and only just opened to the public in 2012. It was pretty impressive to see what 1 billion dollars can buy. From afar, there are two things that stand out. First, the two domes shown in the left of the photo above. 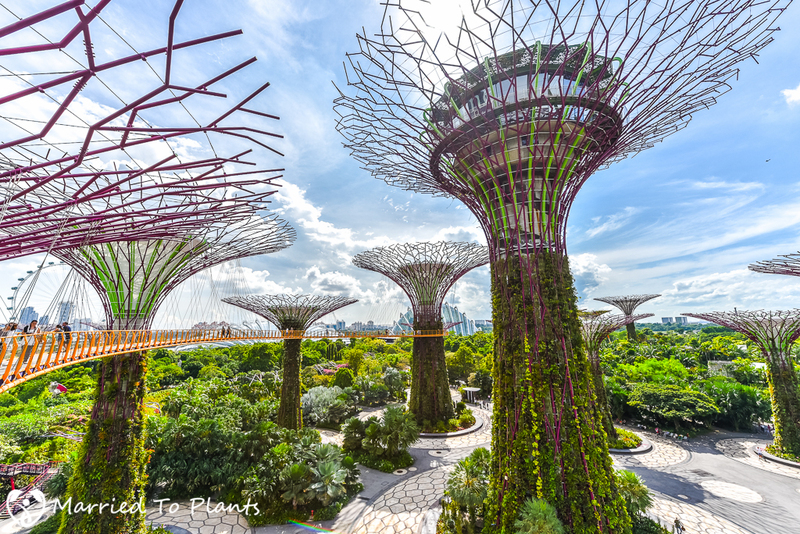 The second thing that stands out are the now world-famous “Supertrees.” There are a total of 18 Supertrees in Gardens by the Bay with 12 of them found in the Supertree Grove shown below. 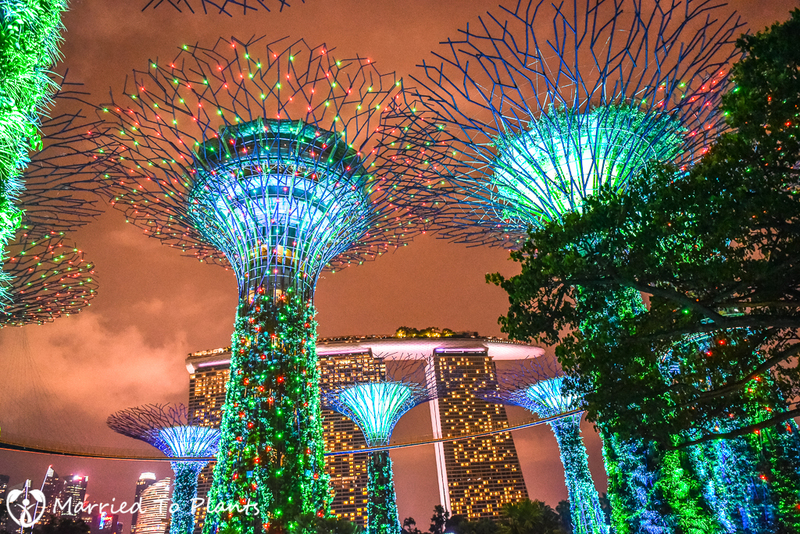 The tallest Supertree measures 16 stories heigh, or 160 ft. A rooftop bar & lounge sits atop the tallest Supertree shown in the middle. 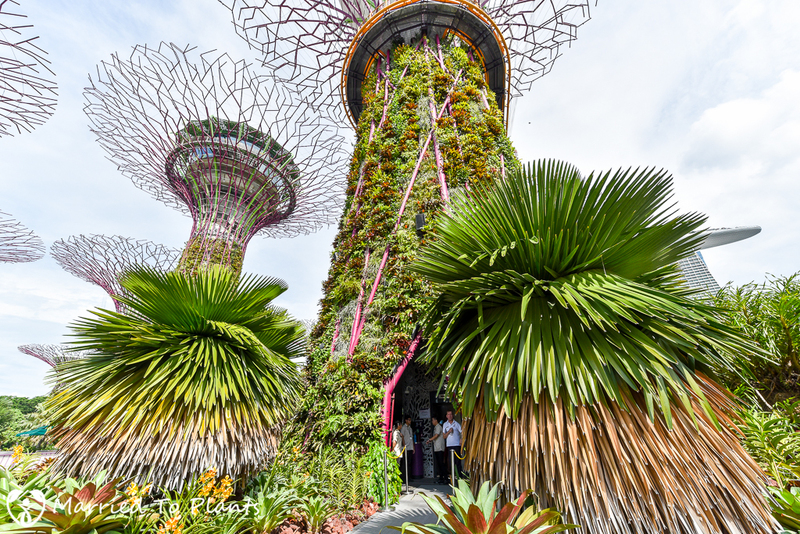 These vertical garden Supertrees were designed to resemble Singapore’s national flower, Vanda ‘Miss Joaquin.’ They serve quite a few functions for Gardens by the Bay, beyond just providing shade during the day and a light show at night. 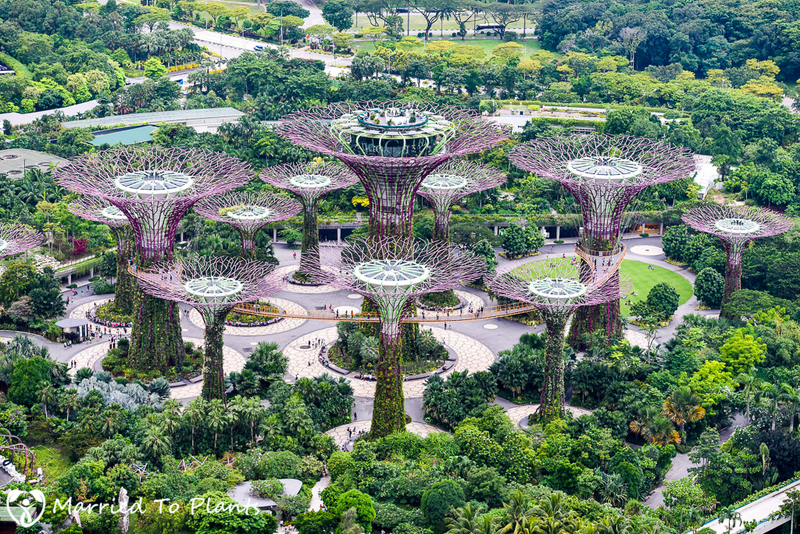 Eleven Supertrees have canopies embedded with environmentally sustainable functions to include photovoltaic cells to harvest solar energy for lighting up the Supertrees, while some are integrated with two carbon neutral conservatories and serve as their air exhaust receptacles. 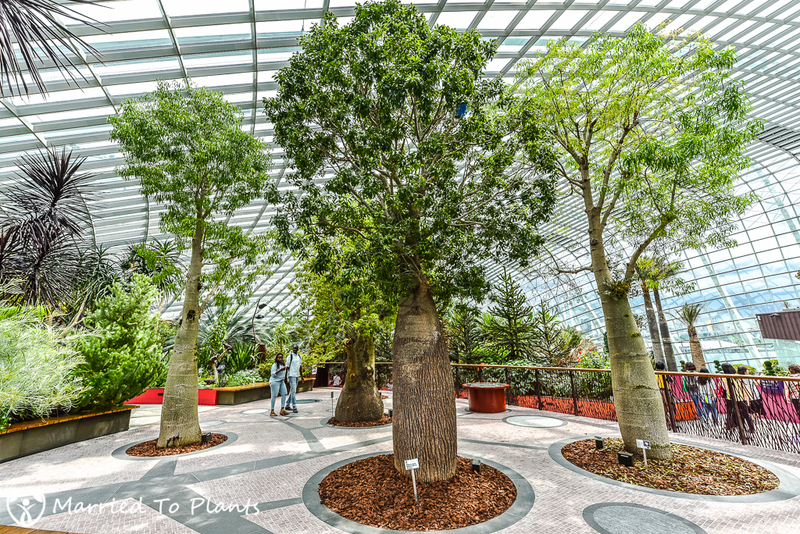 For an interesting perspective on Gardens by the Bay, you can go to the top of one of the Supertrees to walk on the OCBC Skyway. 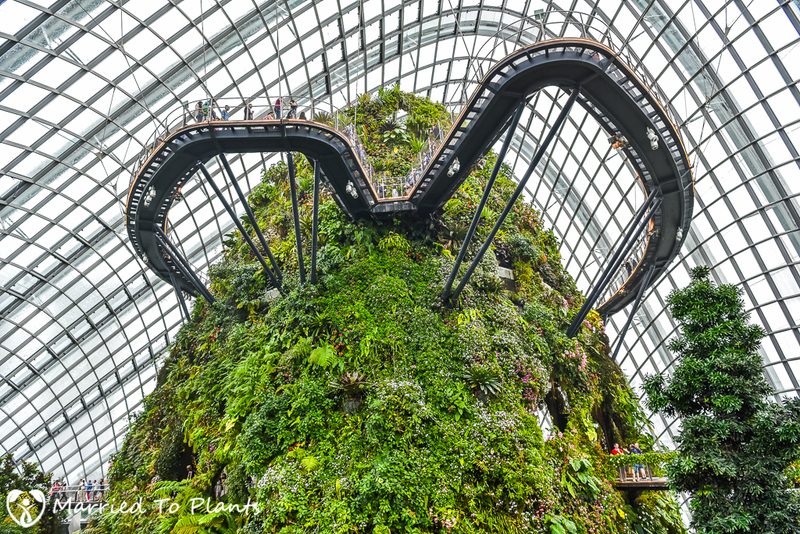 You can either climb stairs to the 65-foot-high walk or take an elevator. 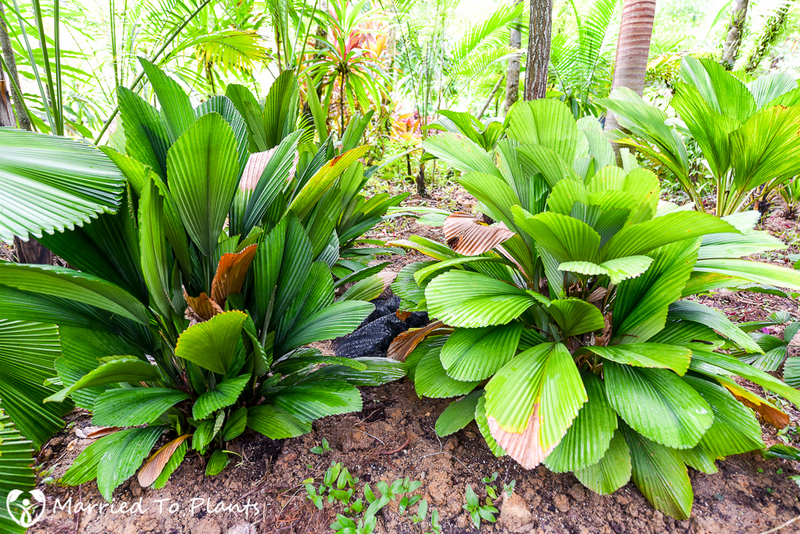 A few Copernicia macroglossa border the entrance. Once at the top, the views from the 420-foot-long skywalk were amazing. The Singapore Flyer is peaking out in the background. 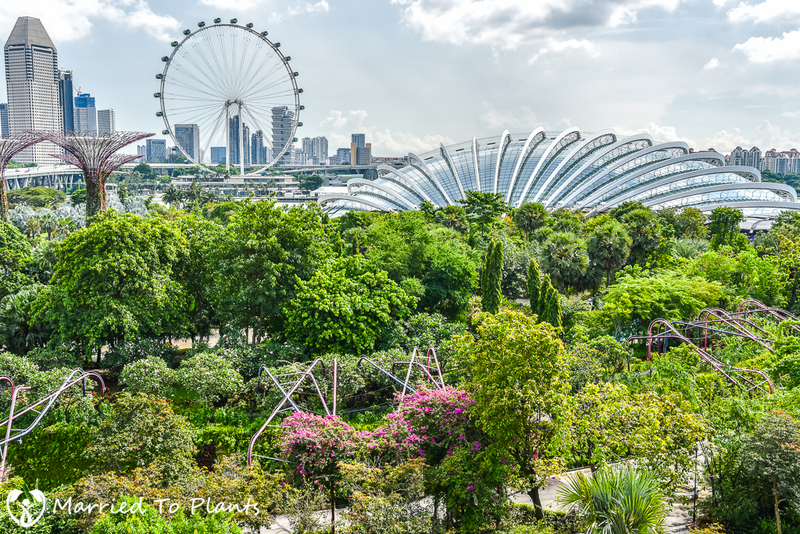 Not part of Gardens by the Bay, it is the world’s second largest observation wheel. 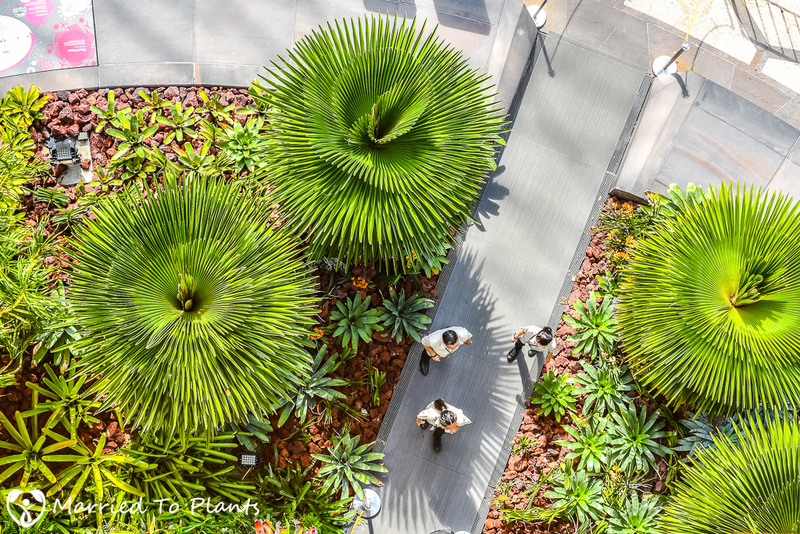 Remember those two Copernicia macroglossa bordering the entrance to the Supertree’s elevator? Here is what they look like from above. Also from above, a great view of some Bismarckia and Copernicia could be found. It was only by coincidence that the two domes were built to look like the tops of sea shells. The design was to support the low-e glass panels that take in approximately 65% of the incident daylight, but only 35% of the solar heat. 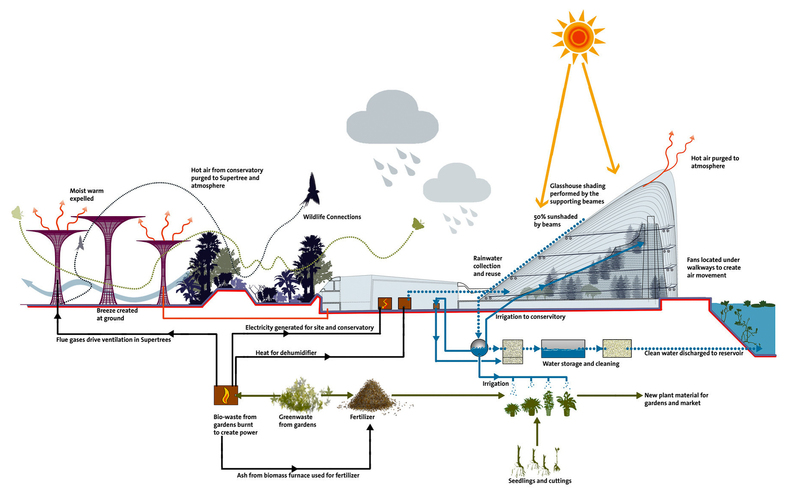 This is one of the key elements in helping the two conservatories achieve carbon neutral status. This flowchart I found online is the best way to explain how the whole thing works. It is very impressive. 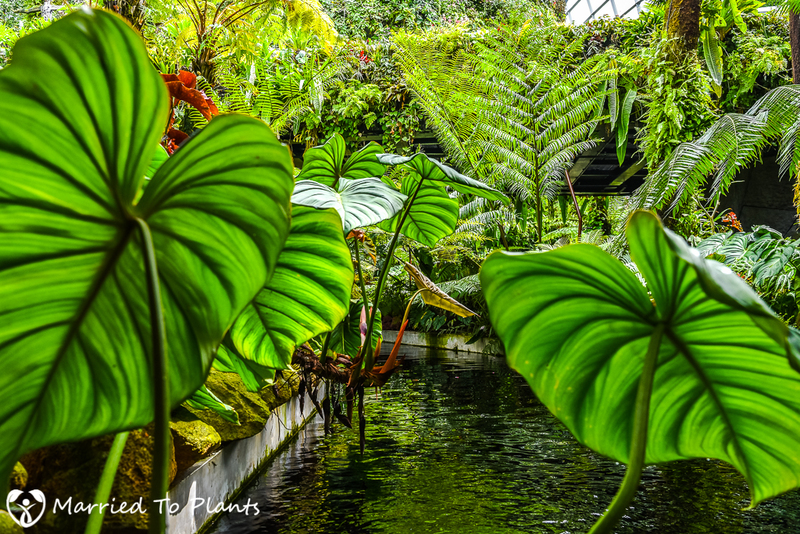 First stop would be the Cloud Forest conservatory. 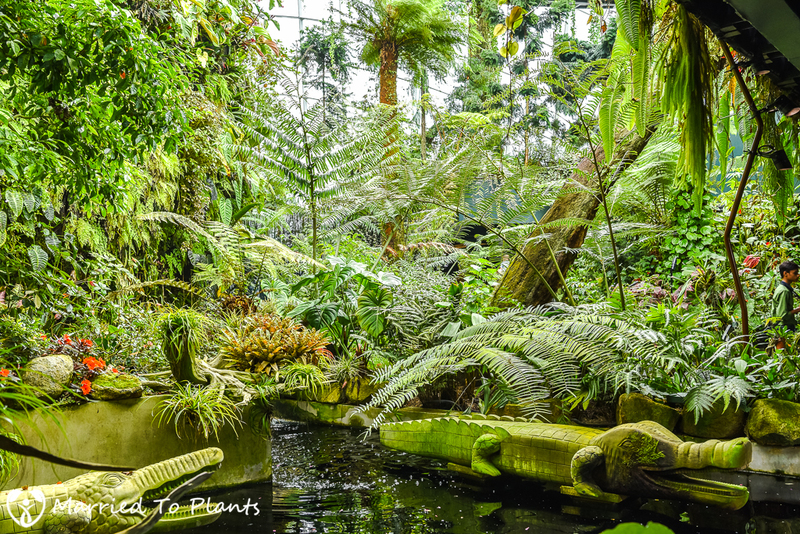 The Cloud Forest is a 115-foot tall mountain covered in vegetation from tropical highlands around the world. Some of which can be found as high up as 6,450 feet above sea level in habitat. 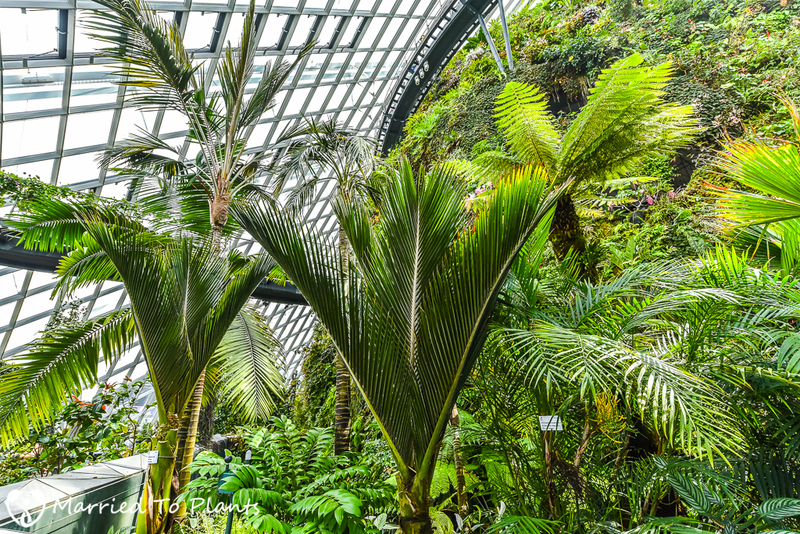 In hot and humid Singapore, only a climate-controlled greenhouse could allow you to grow these plants. 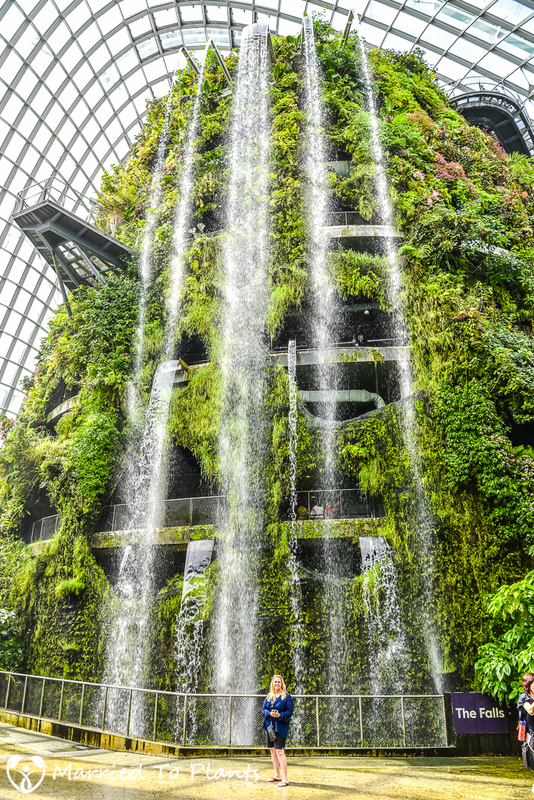 Upon entering the Cloud Forest, the first thing you’ll notice past the cooler temperature found inside is the world’s tallest indoor waterfall. 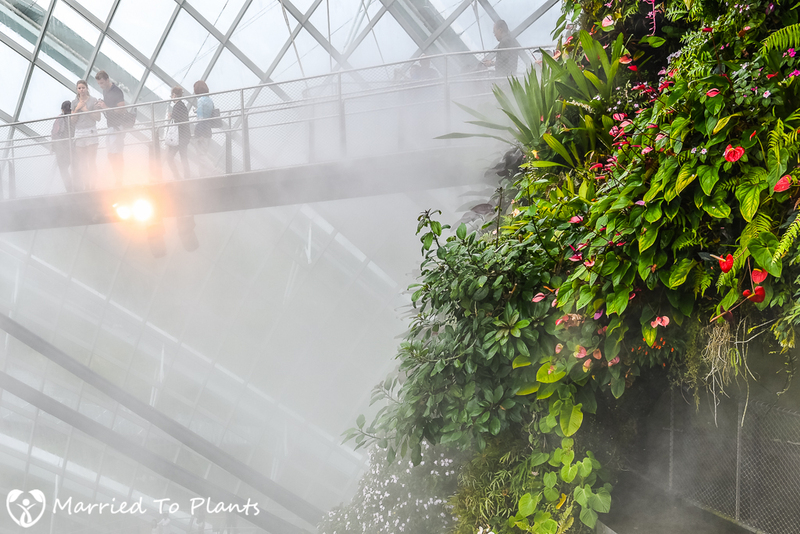 On the backside of the Cloud Forest mountain you can see the skywalk that is built in. 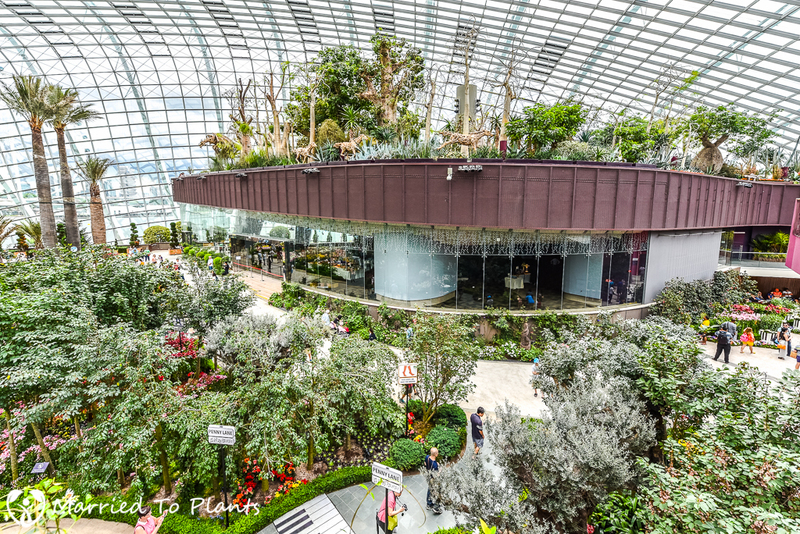 From up top you can admire the size of the conservatory and explore all the different plants it is home to. Misters go off periodically to help keep the humidity in the Cloud Forest between 80% – 90% and the temperature at 73ºF – 77ºF. Everyone loves to cool off next to the waterfall. 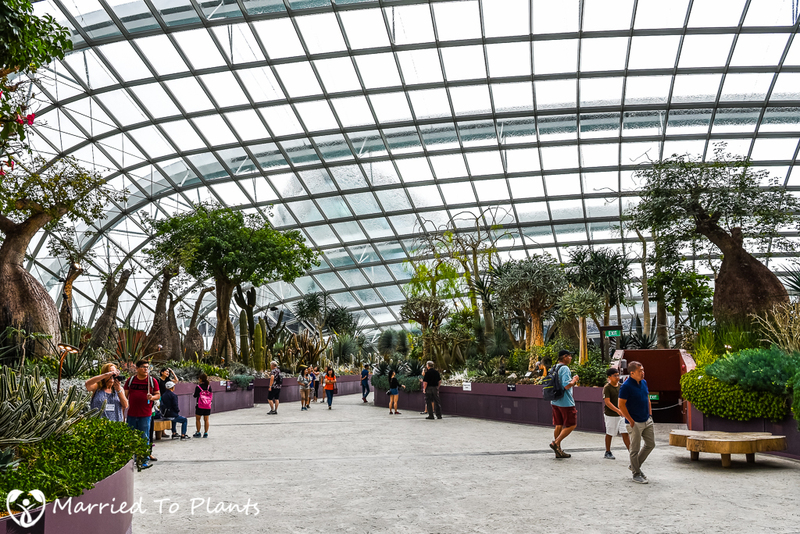 Gardens by the Bay is a popular field trip location for school kids. 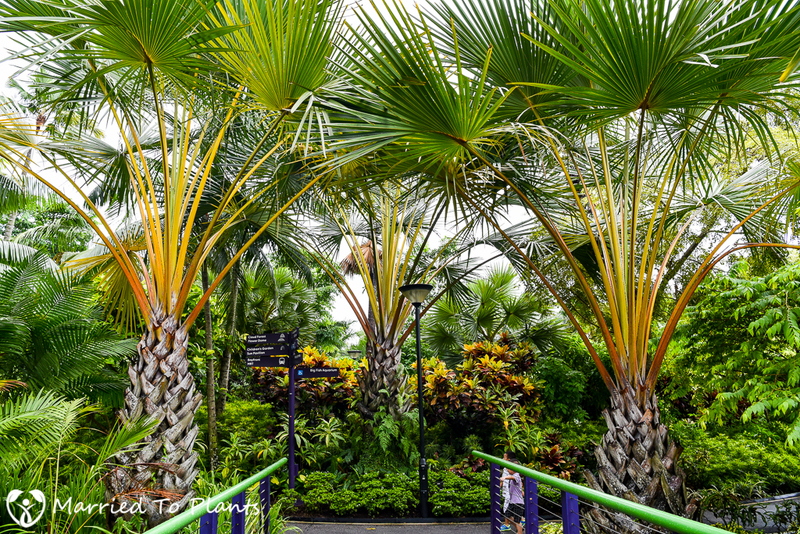 The Shaving Brush Palm (Rhopalostylis sapida) from New Zealand would have no hope of living outside in the Singapore heat. 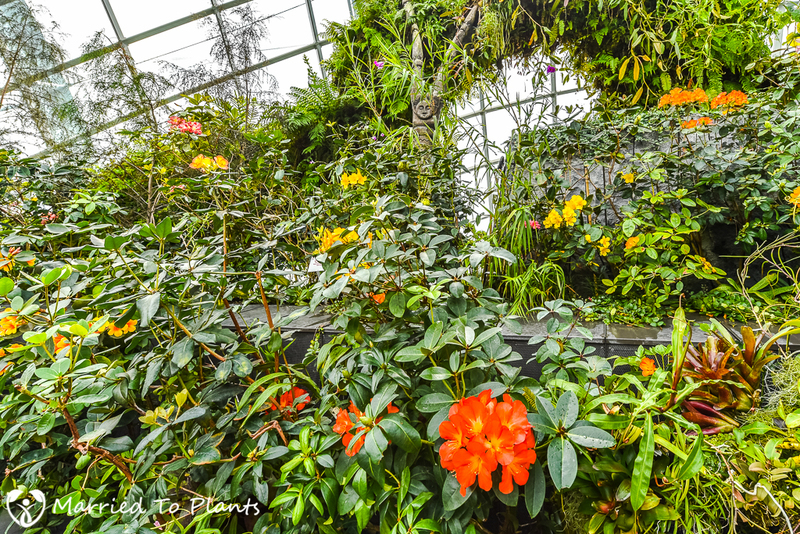 Tropical Rhododendrons and Begonias of every color can be found throughout the Cloud Forest. 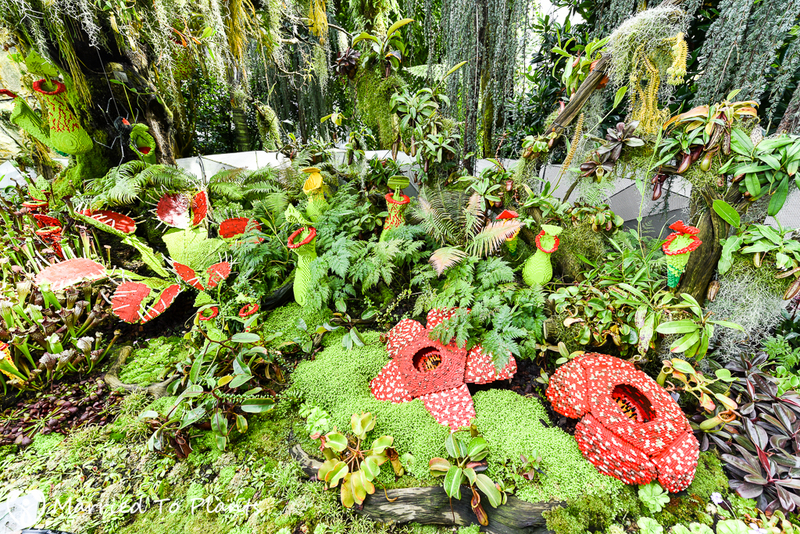 Rafflesia can not be grown outside its native habitat of the jungles of Southeast Asia. So it needs to be built in Legos. 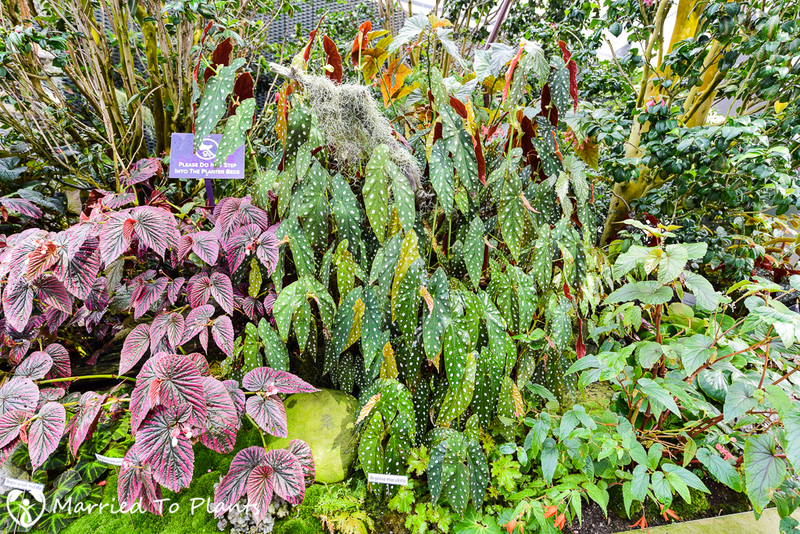 However, Nepenthes (Tropical pitcher plants) can be grown and are found in mass in two nice displays to honor them. 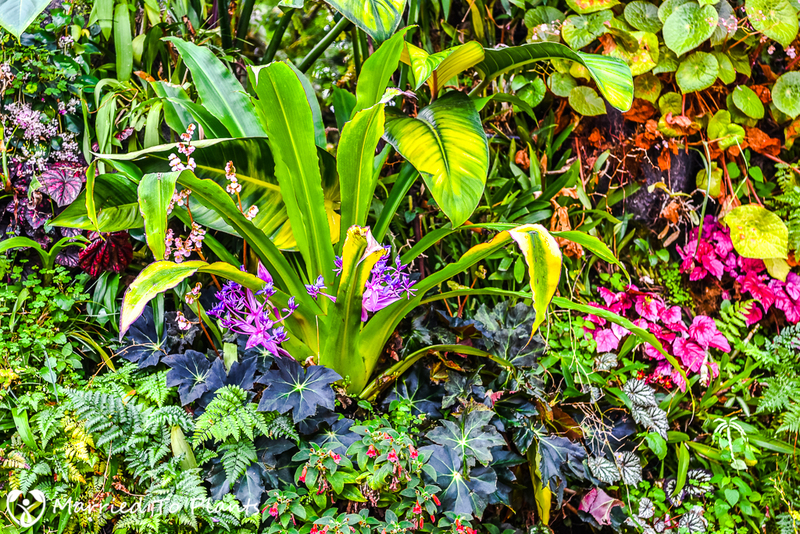 The Cloud Forest mountain has almost too many plants to really focus on any one in particular. This Cochliostema odoratissima that was flowering stood out. 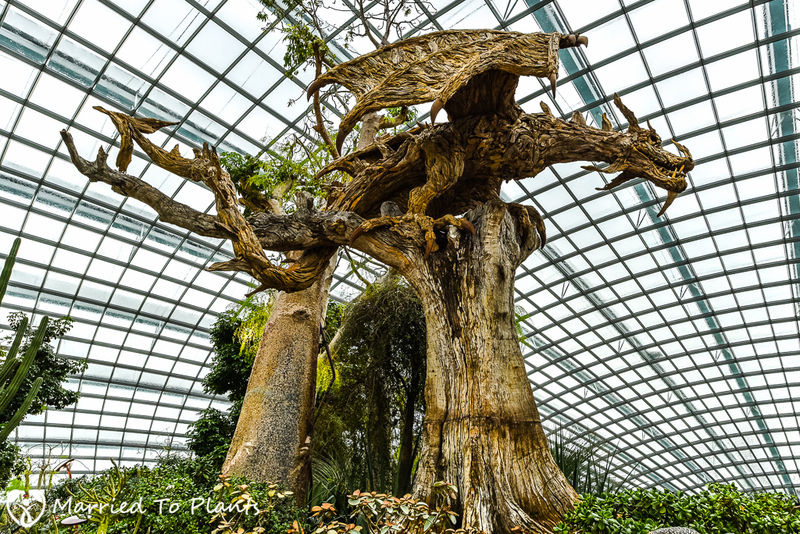 Something you will find scattered all around Gardens by the Bay is wood carvings and driftwood art. 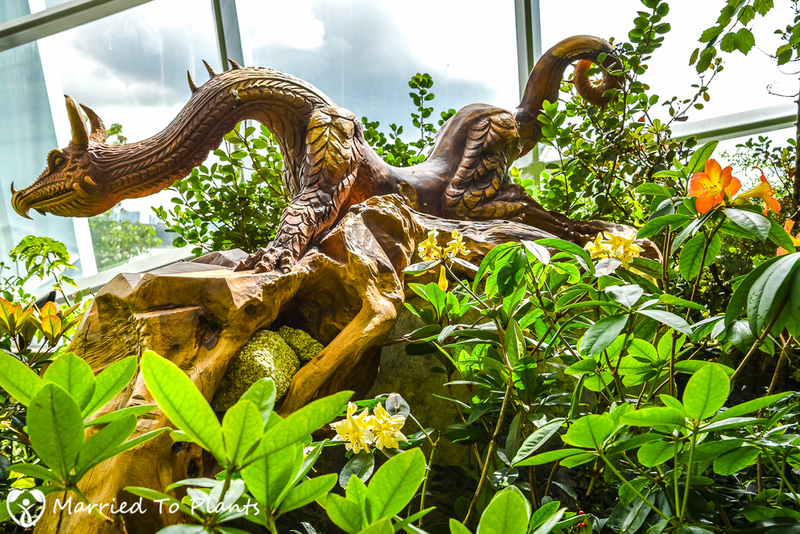 Tropical Rhododendrons border this wood-carved dragon. Various fern species surrounding a mounted piece of driftwood art. 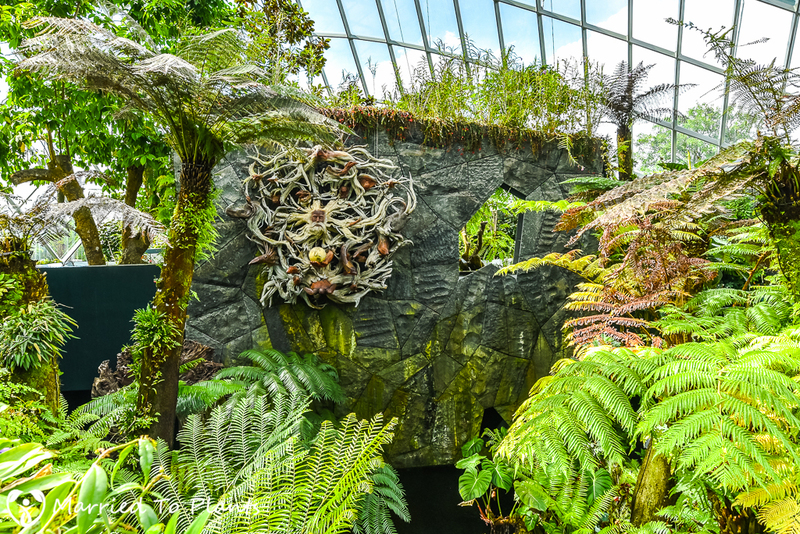 Angiopteris ferns highlight the waterway under the Cloud Forest mountain. 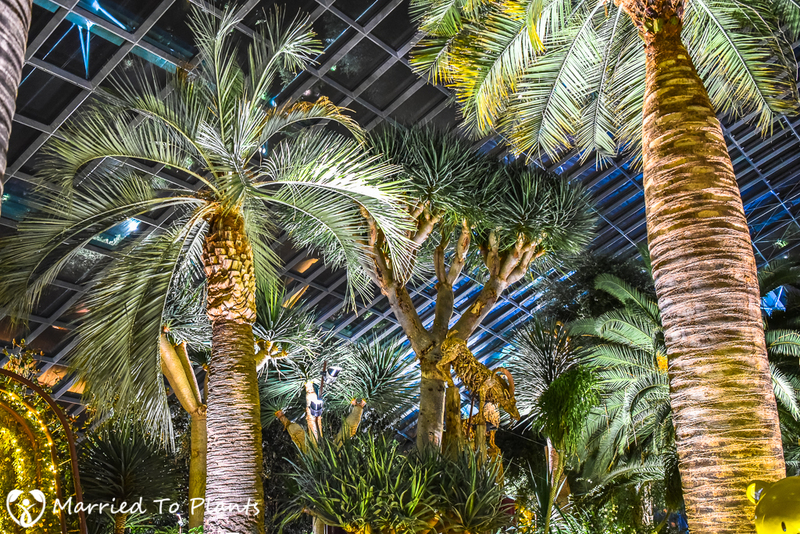 The next stop was to the Flower Dome conservatory, where the Mediterranean climate plants are grown. 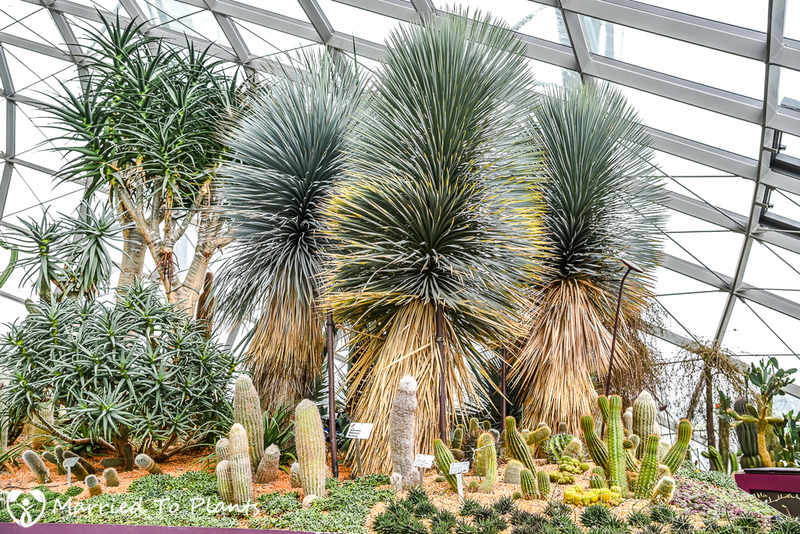 According to Guinness World Records, it is the largest glass greenhouse in the world. 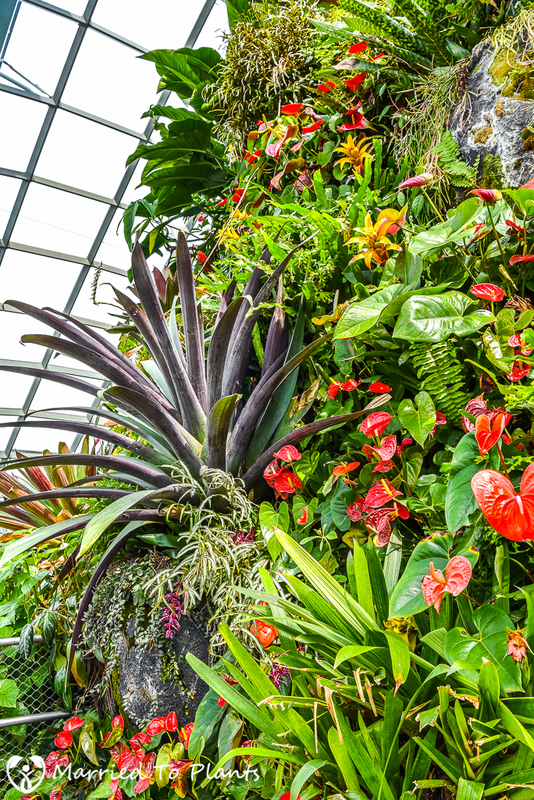 The humidity in the Flower Dome is kept between 60% – 80% and the temperature at 73ºF – 77ºF. 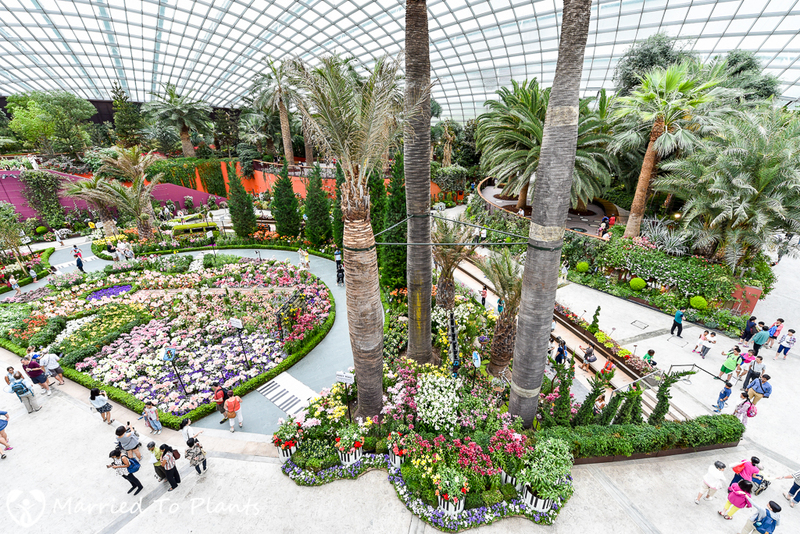 The Flower Dome is most known for its theme-changing floral displays in the Flower Field. 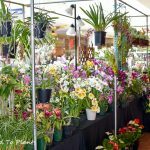 The themes reflect different seasons and festivals and draw huge crowds. During my visit it was Lilytopia! 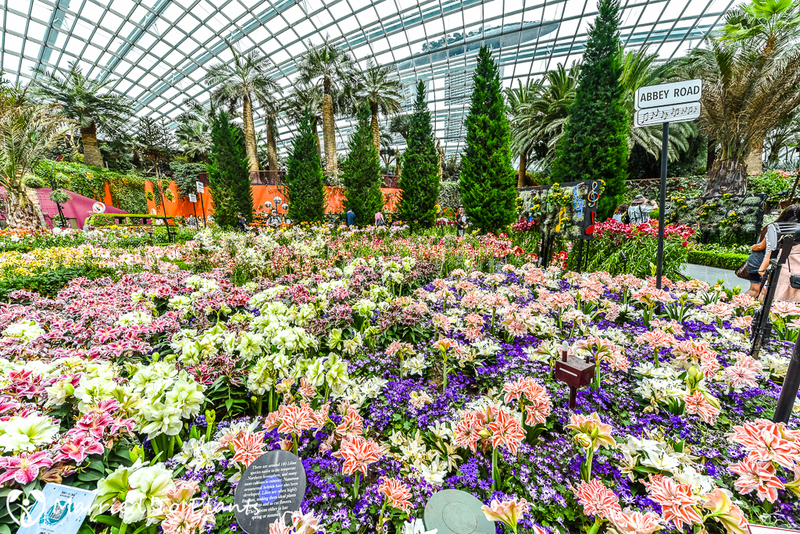 Showcasing over 50 varieties of lilies from over 7,000 imported bulbs from Europe, Lilytopia! didn’t disappoint. 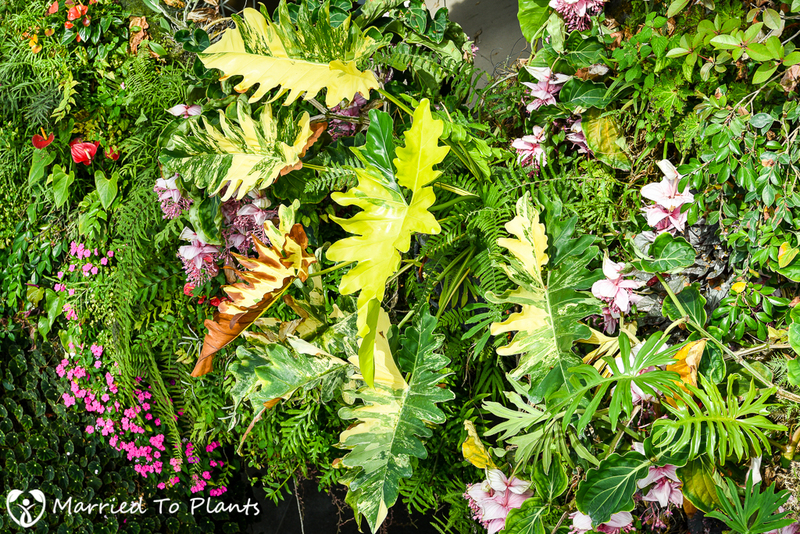 All available space is used for planting in the Flower Dome. Even the roof of the Banquet Room. 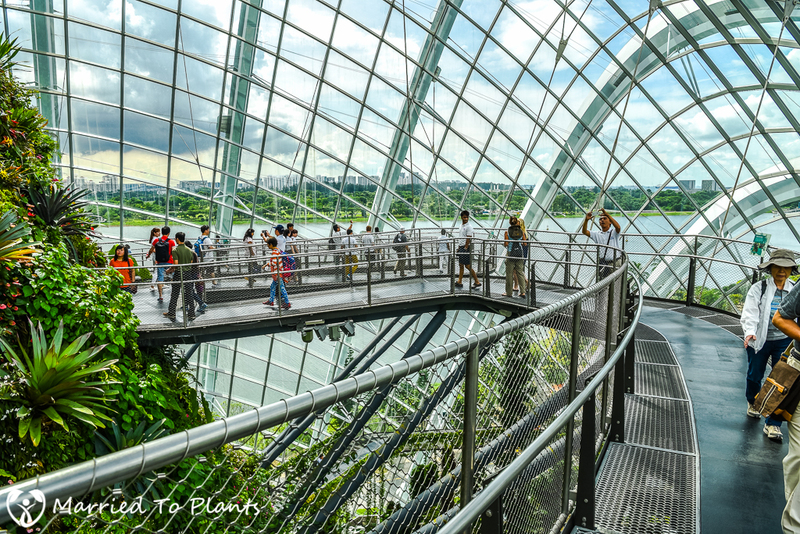 One thing that I particularly enjoyed about the Flower Dome was the wide walkways. The different perspective from the top of the Banquet Room was a nice touch. 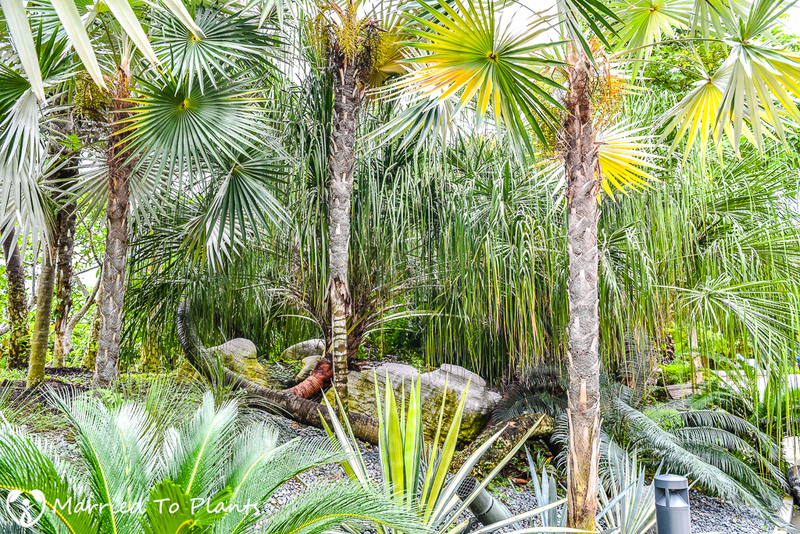 The three palms in the middle of the photo are recent additions from Chile. They don’t look that good right now because they were stuck on a container ship for 8 months. 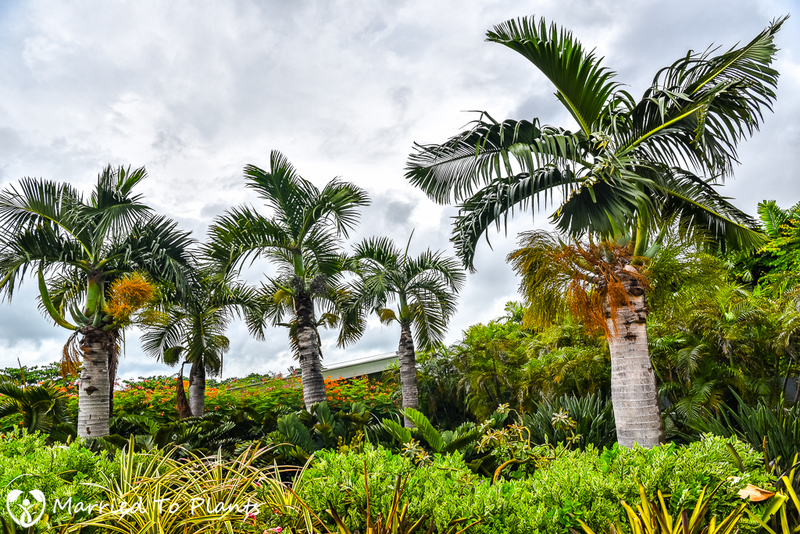 Those are Chilean Wine Palms (Jubaea chilensis). 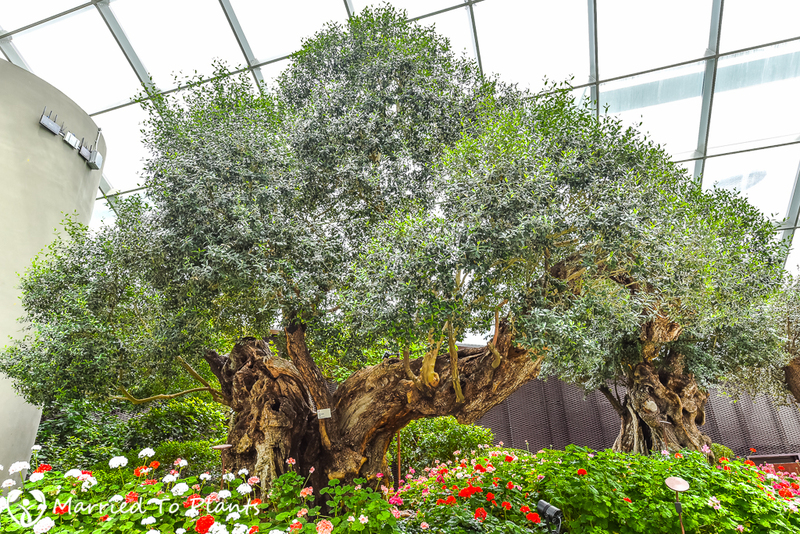 Brought to Singapore from Spain in 2011, this over 1,000-year-old olive tree is likely the most photographed tree in the conservatory. This olive tree has actually flowered and set fruit. Something impossible to do outside in hot, humid Singapore. 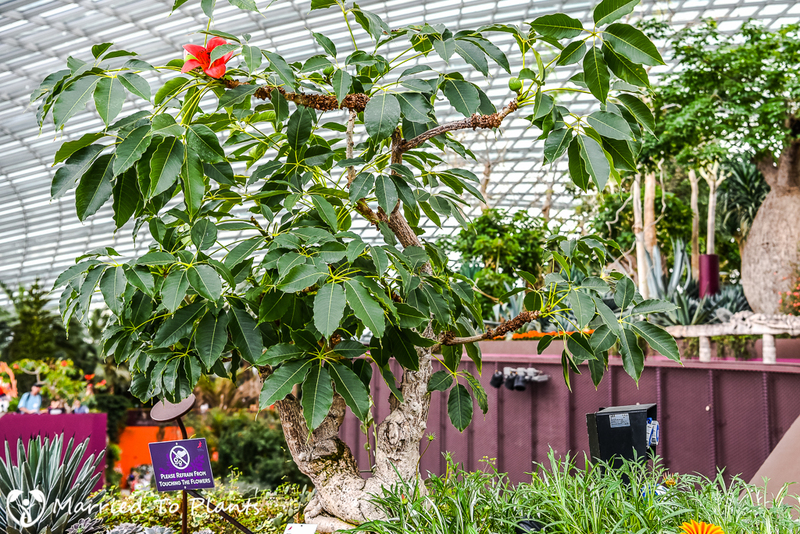 The African Baobab (they say it is an Adansonia digitata) on the left is the largest tree in the Flower Dome, weighing in at more than 32 tons. A currently skinny Queensland Bottle Tree (Brachychiton rupestris) front and center. 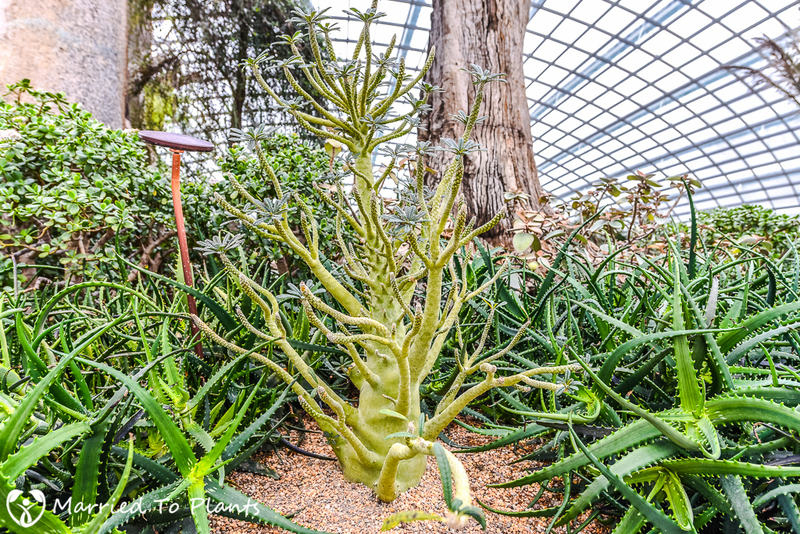 Three Moringa drouhardii (incorrectly called Ghost Trees by Gardens by the Bay – Moringa ovalifolia is the true Ghost Tree) to the left, Aloe dichotoma in the center, and 6 Agave “Blue Glow” in the foreground were all imported into Singapore. 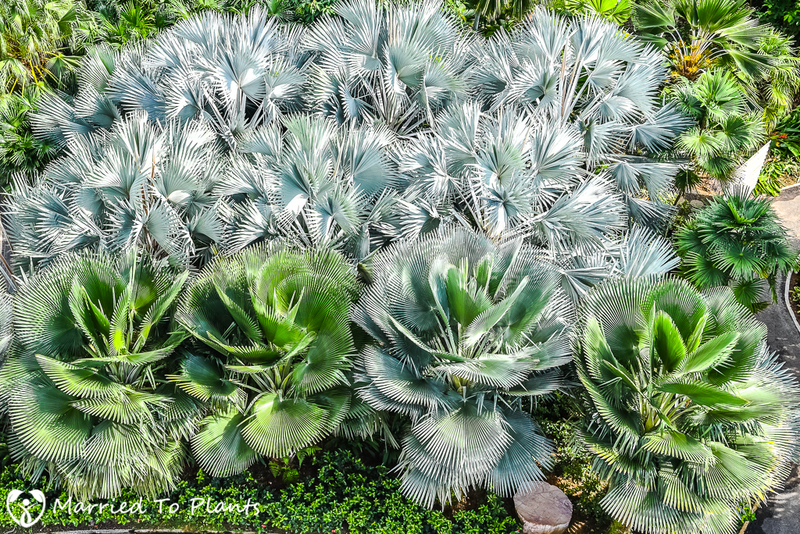 Interesting fact: The Agave “Blue Glow” were purchased from Rancho Soledad Nursery here in San Diego. 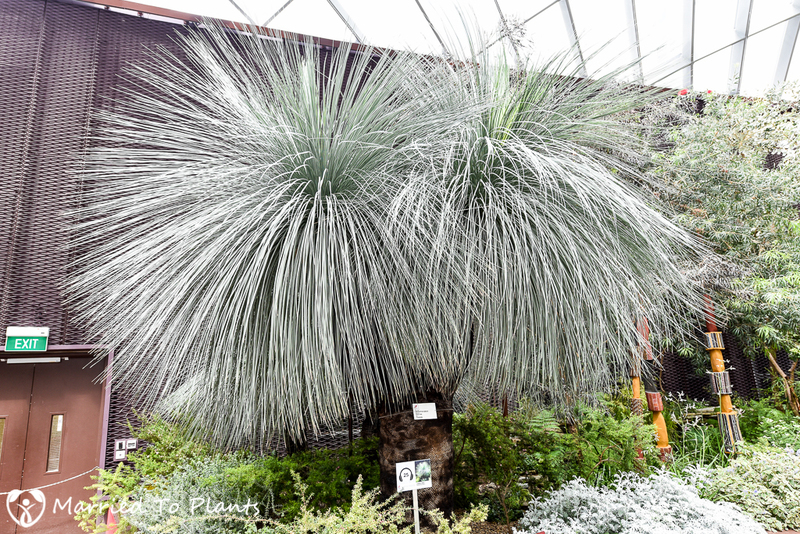 A beautiful Xanthorrhoea glauca imported from Australia. 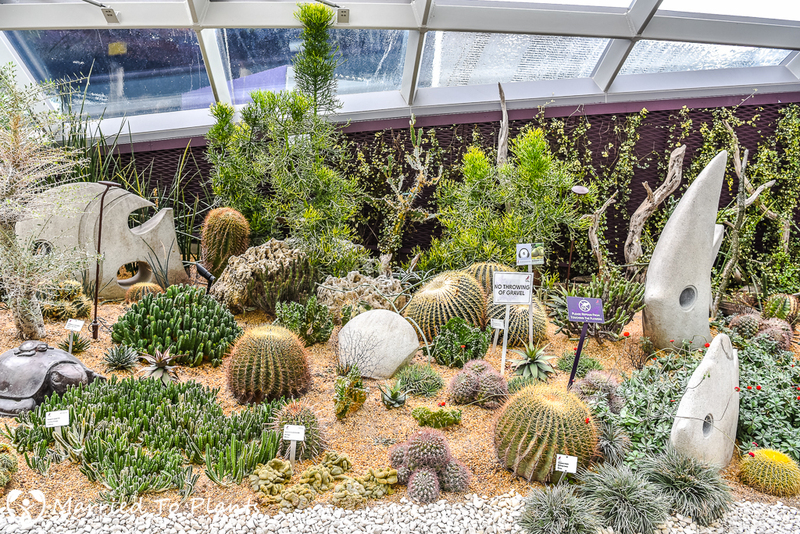 One of many cactus and succulent displays. A nice Dorstenia gigas coming out of dormancy. 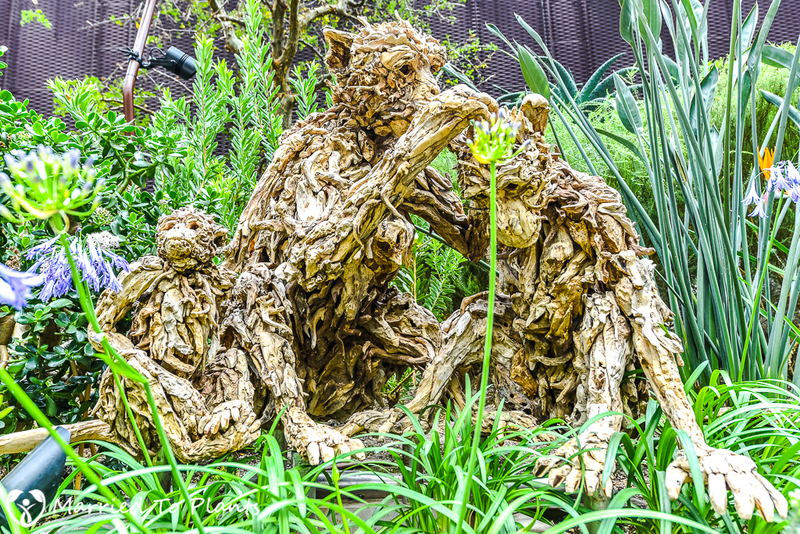 Just like in the Cloud Forest conservatory, driftwood art can be found in the Flower Dome as well. 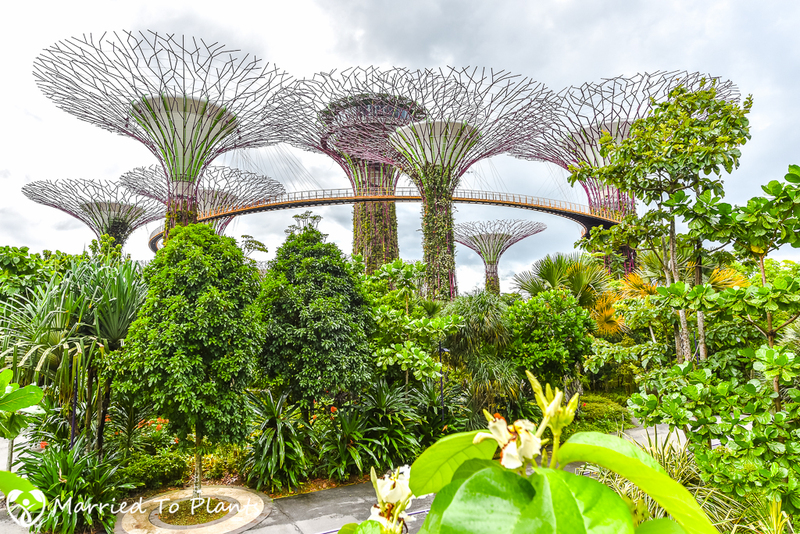 After a quick lunch it was time to tour the rest of Gardens by the Bay. 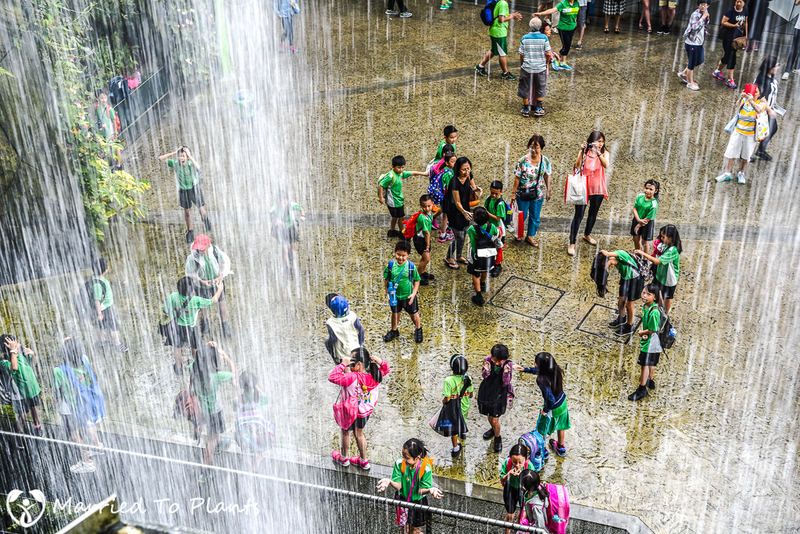 The remainder of the time would be spent out in the best heat and humidity that Singapore could offer. With a large storm quickly approaching, I had to move fast. 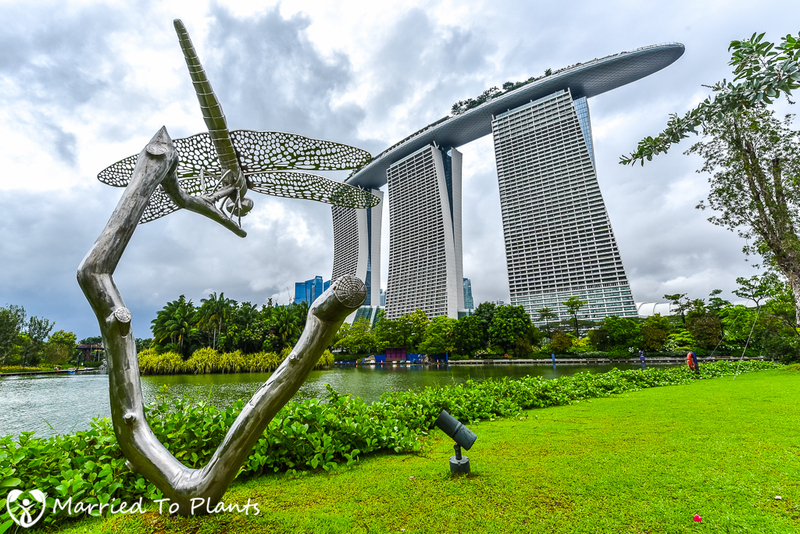 The view from Dragonfly Lake of the now iconic Marina Bay Sands resort. It is the world’s most expensive hotel ever built. The original plan was for 5 towers. They had to settle on 3. 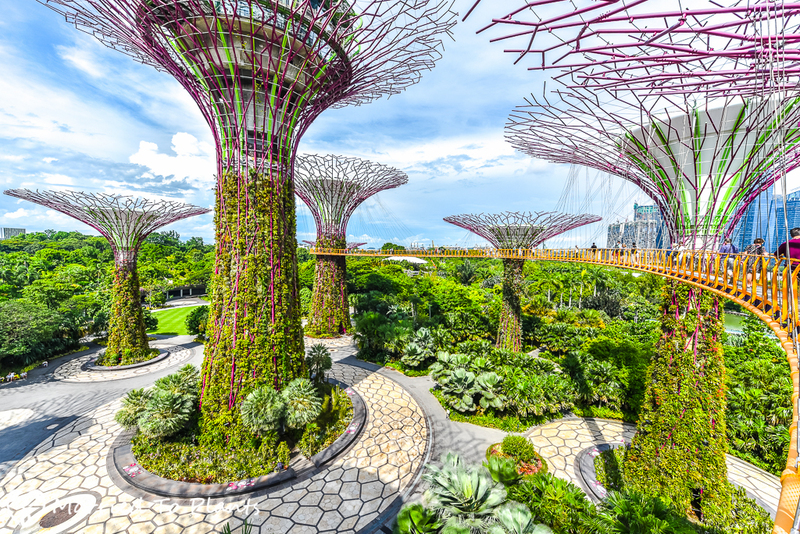 The Supertree Grove behind Dragonfly Lake. 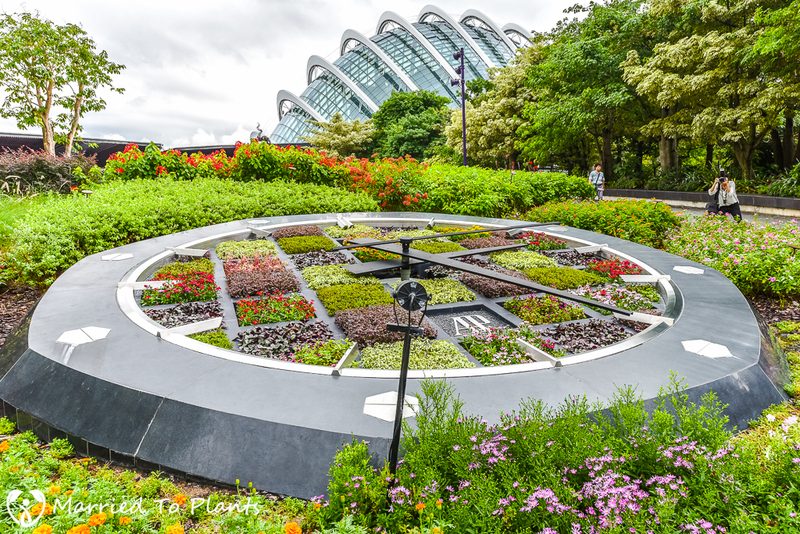 Swiss watch maker Audemars Piguet, along with Gardens by the Bay, designed this floral clock to celebrate Singapore’s 50th Independence anniversary. 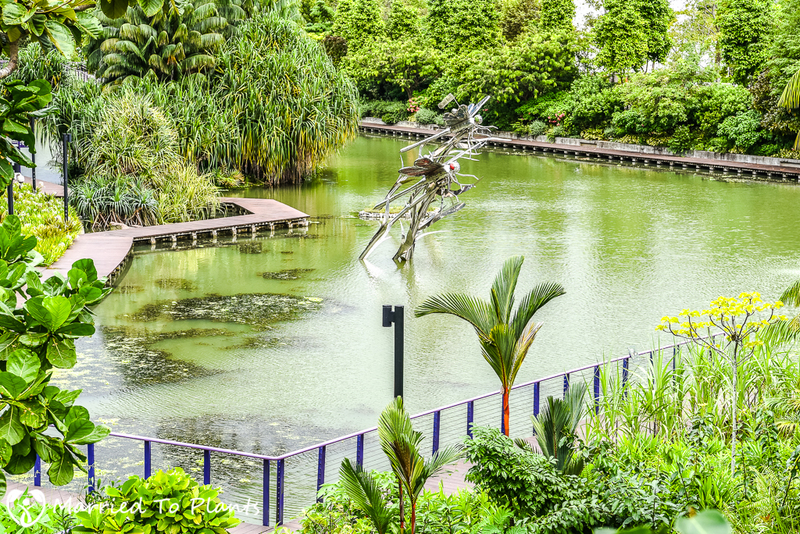 The Cloud Forest conservatory is in the background. Marina Bay Sands peaking out from behind some unique limestone boulders. I really liked this display. 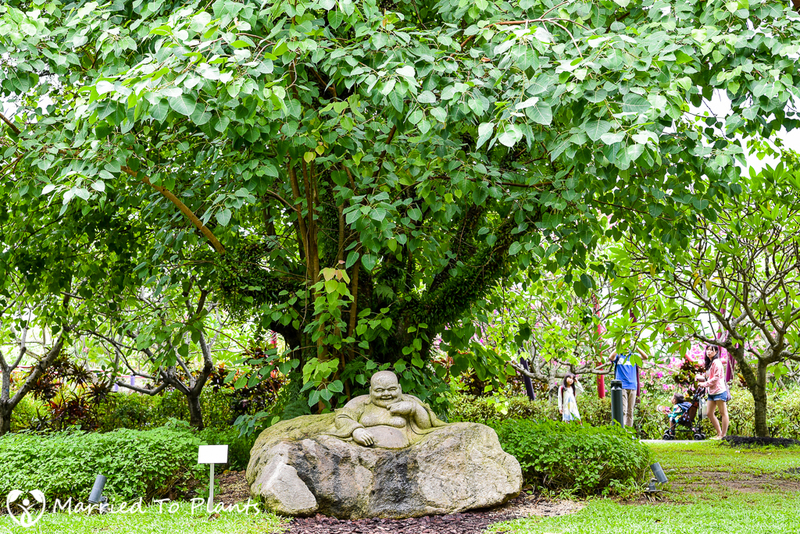 It is of course Buddha seeking enlightenment under the Bodhi Tree (Ficus religious). This Buddha was carved from a single stone boulder. 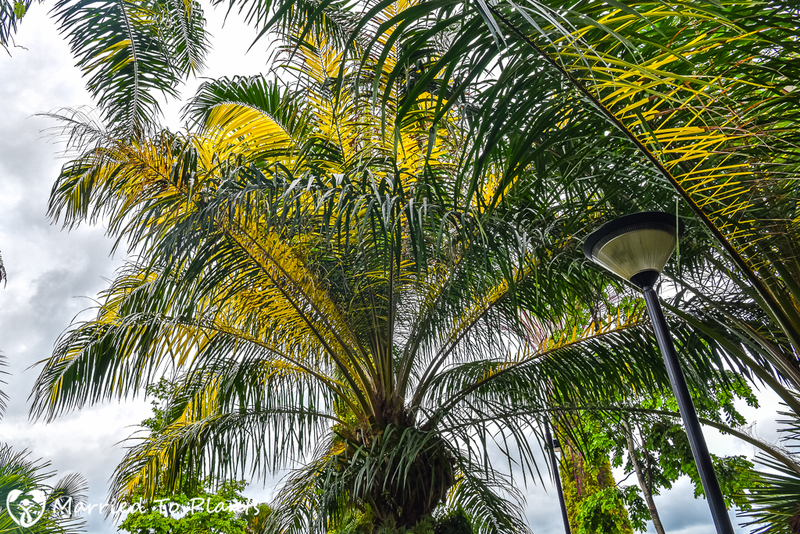 Since I was there with the International Palm Society, palm trees were the focus. An odd hourglass Pseudophoenix sargentii. 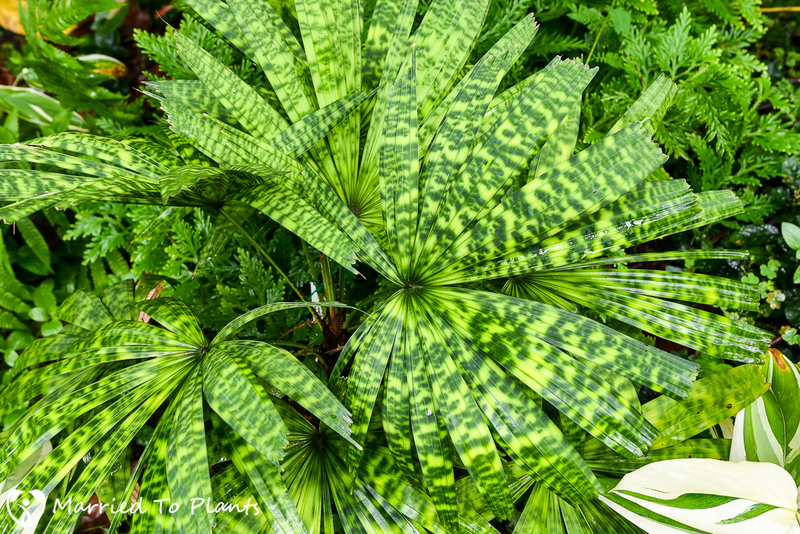 Livistona benthamii ‘Golden Form.’ Yes, the leaves are supposed to look like they need a dose of nitrogen fertilizer. 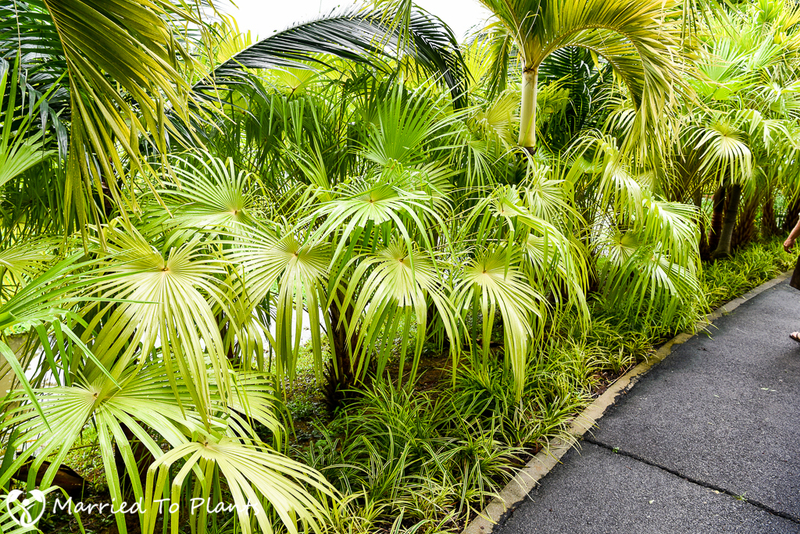 Those leaves and the beautiful petioles are what give this Livistona benthamii the ‘Golden Form’ name. 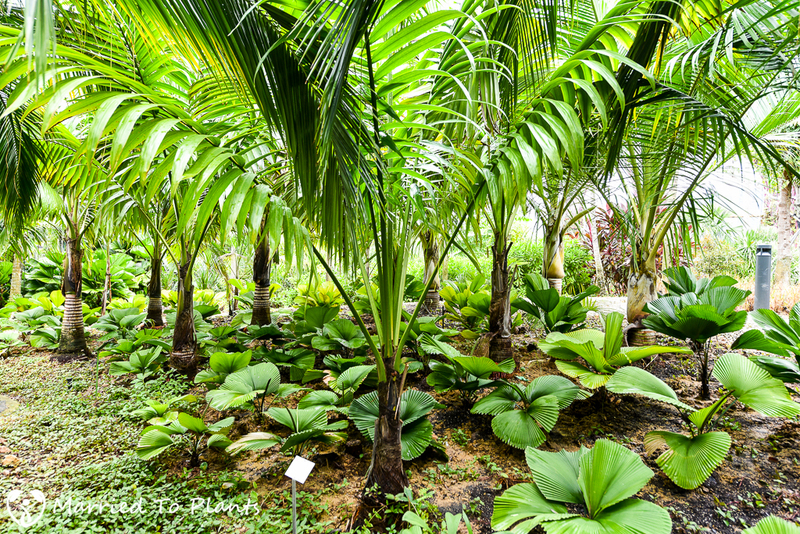 What tropical botanical garden would be complete without at least one of the most iconic palms in the world – the Double Coconut (Lodoicea maldivica). 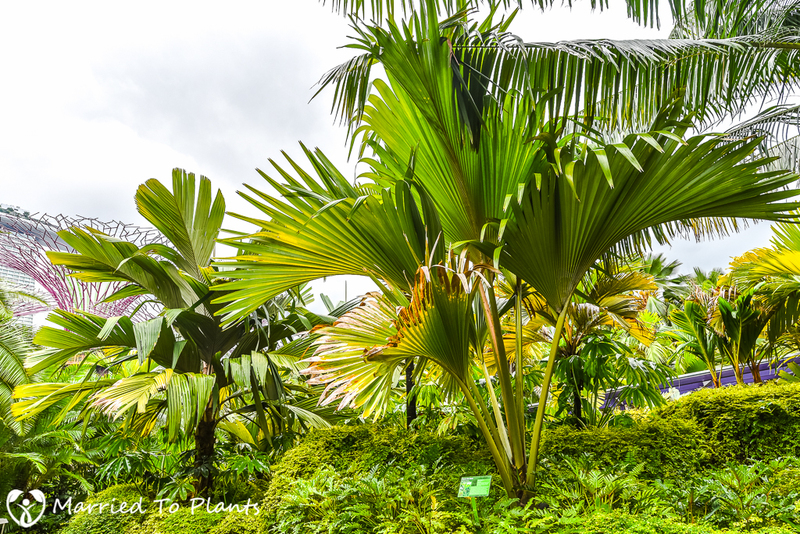 Common in the tropicals, but always beautiful when well grown – Hyophorbe verschaffeltii. Satakentia liukiuensis with a few different Licuala species below them. One of my favorite palms in the world. Sadly I can not grow Licuala mattanensis ‘Mapu’ in Southern California. 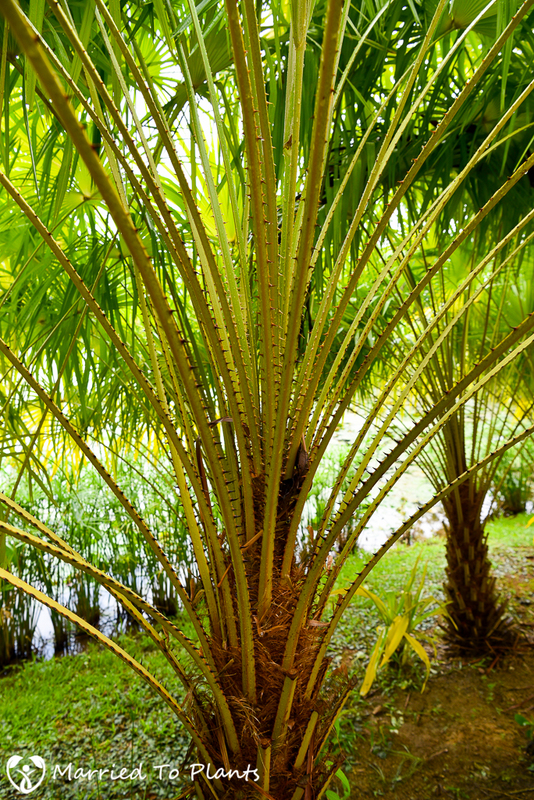 Variegated African Oil Palm (Elaeis guineensis). After my trip to Borneo, I became a big fan (no pun intended) of the genus Iguanura. 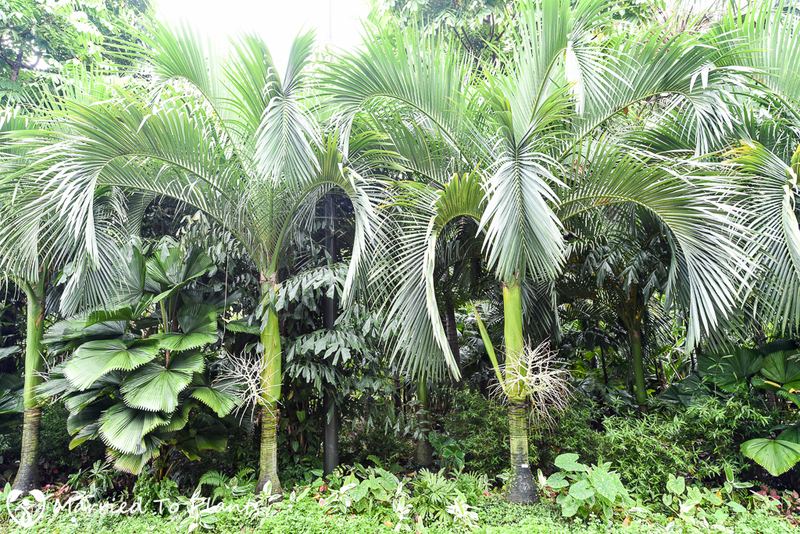 A row of Bismarckia nobilis to the right and Copernicia to the left. 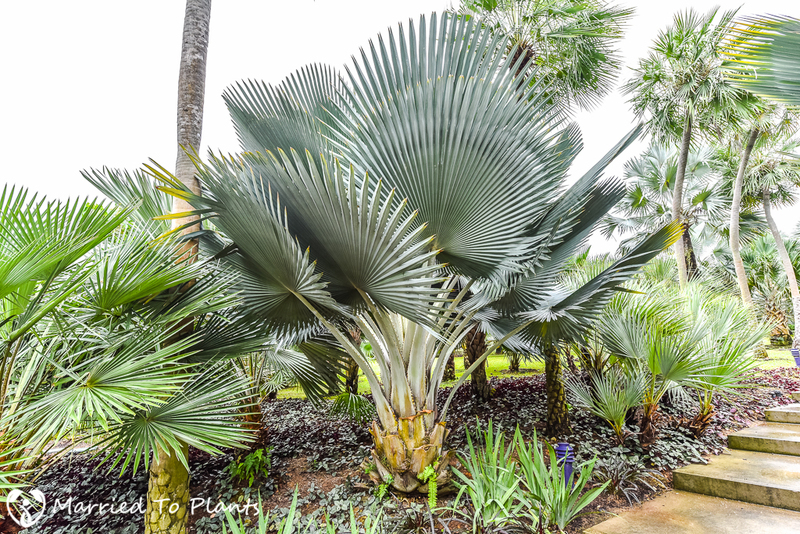 Another of my favorite palm trees – Copernicia fallaensis. 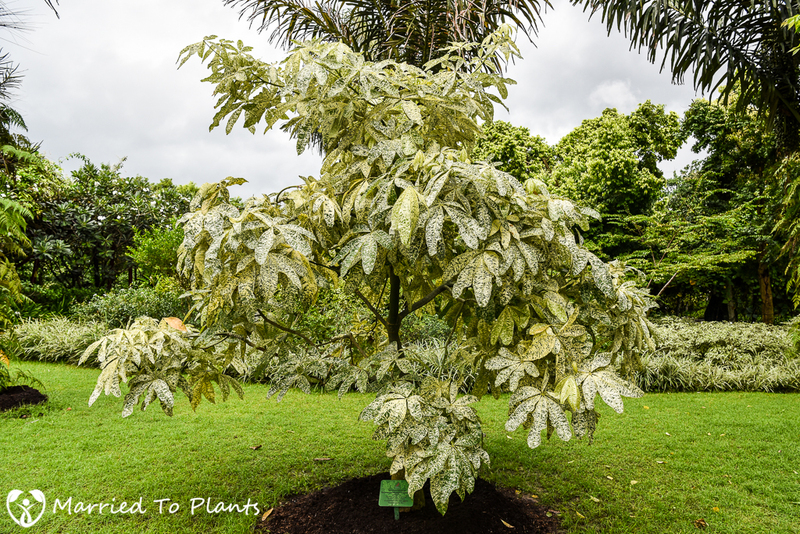 A Livistona chinensis snaking on the ground under some Cocothrinax. 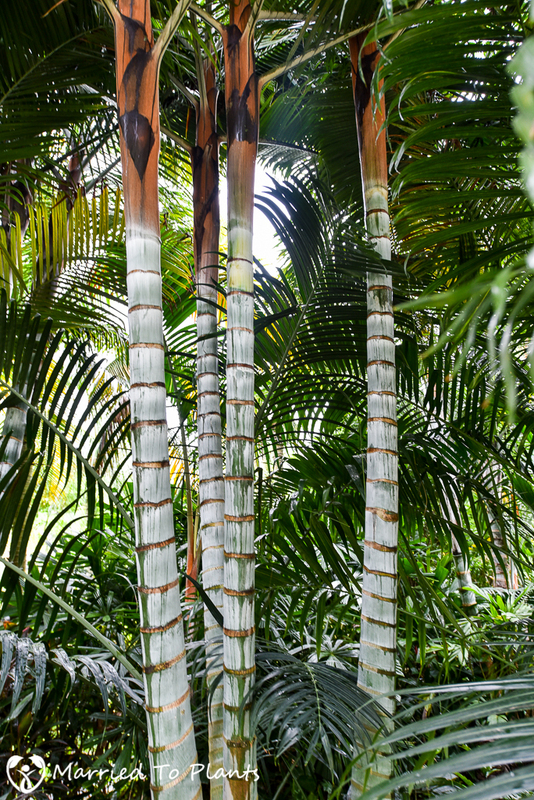 I believe this is Dypsis cabadae x leptocheilos. A real beauty. Kerriodoxa elegans about to be hit with a rainstorm. This photo below of a few young Corypha umbraculifera with some Supertrees behind them should tell you my day was done. 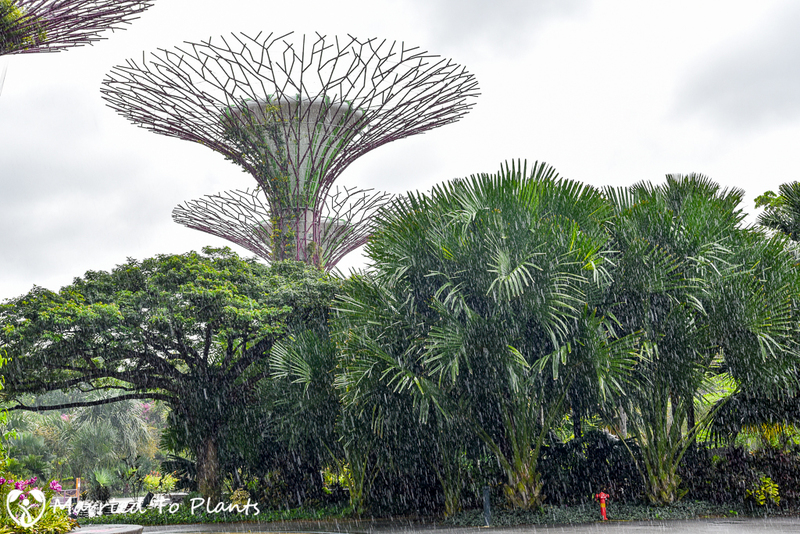 I waited for the rain to let up but I was eventually told by someone at Gardens by the Bay that it was a large storm and would last through the day. 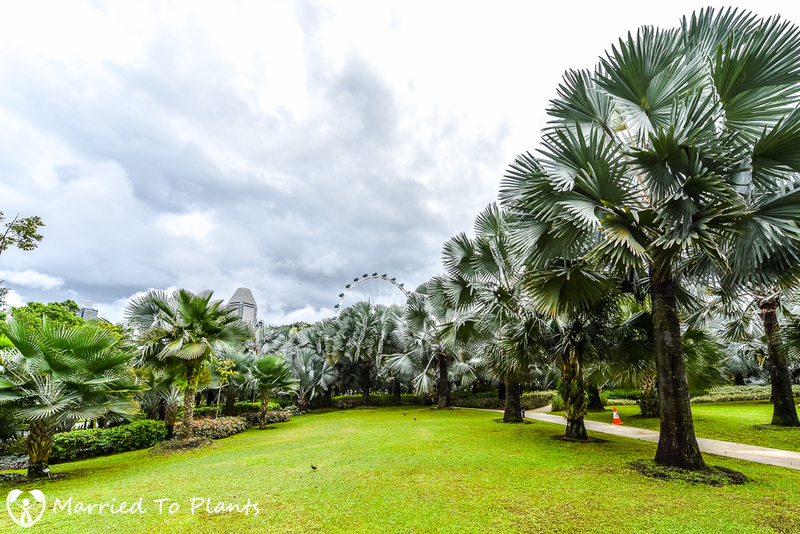 Sadly, my tour of all the palm trees Gardens by the Bay had to offer was over. It proved to be a very wet walk back to the hotel, by the way! 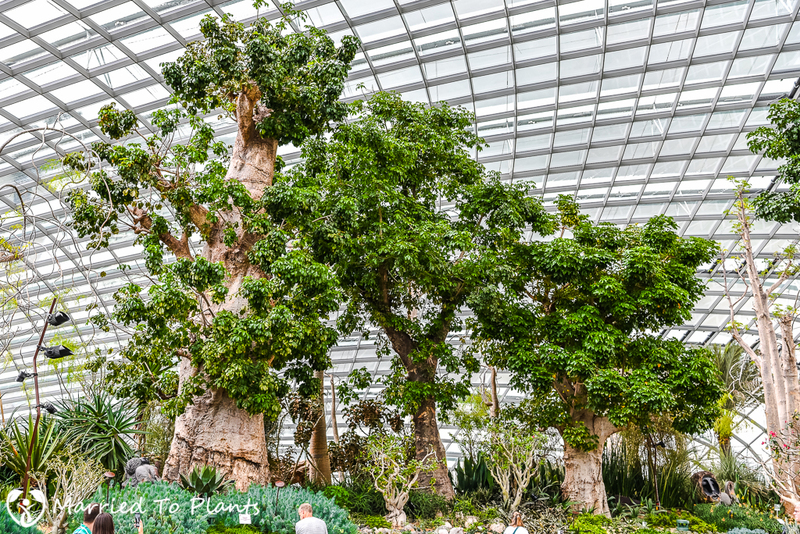 The next evening, Gardens by the Bay put on a farewell banquet for all the members of the International palm Society that made the trip. 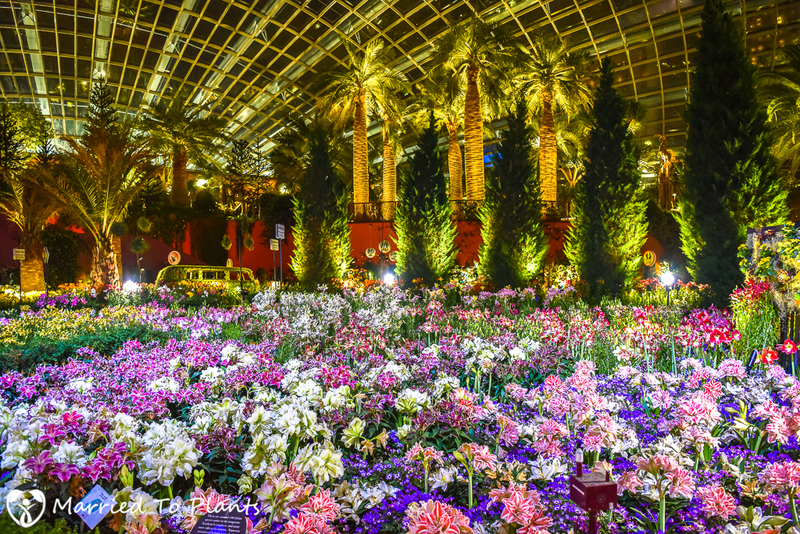 As part of that farewell dinner we had a chance to see the Flower Dome at night. 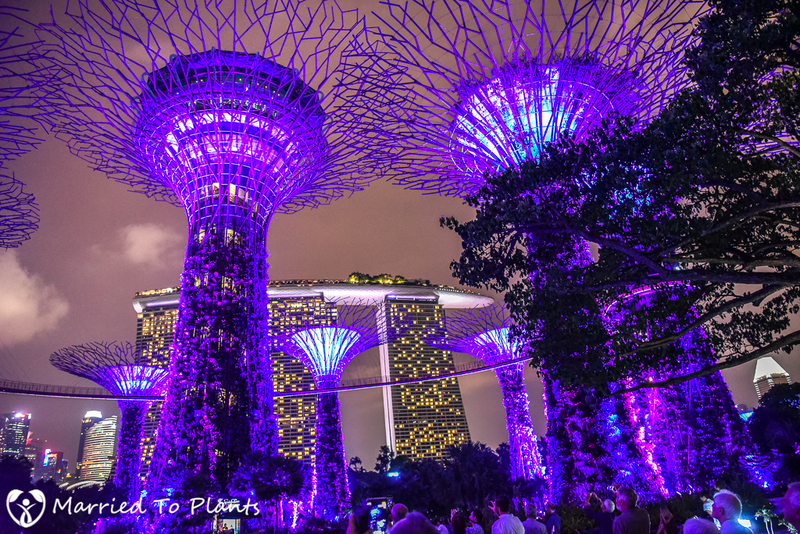 We also were shown a special playing of “Garden Rhapsody.” Garden Rhapsody brings the Supertrees alive with a fantastic display of lights and music under the evening sky. On our walk back to the hotel, I was able to snap a photo of the “Floating Baby.” I had missed it the day prior due to the rainout. 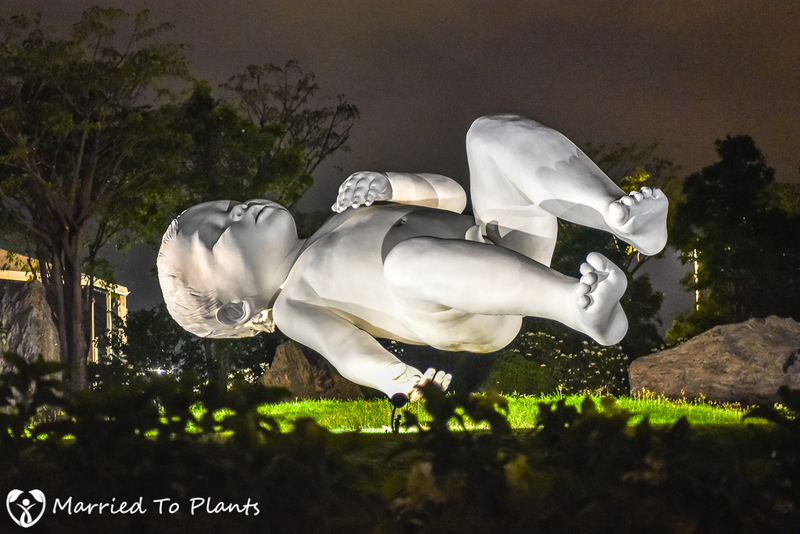 The artwork was done by Marc Quinn and it is actually called “Planet.” The sculpture is a depiction of the artist’s infant son and it is most noted for its appearance to float above the ground. Only the baby’s hand touches the ground. 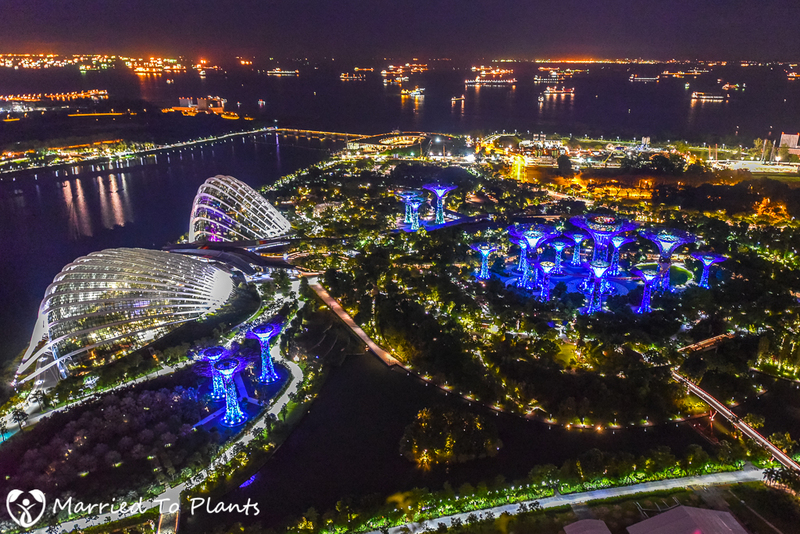 Before heading to bed, one last look back at Gardens by the Bay from our hotel room window. What an amazing place. 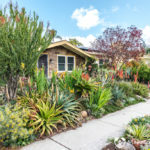 The staff was extremely friendly and accommodating, the property was well thought out, and it had a little of everything to satisfy even the harder to please plant snobs. More good news. 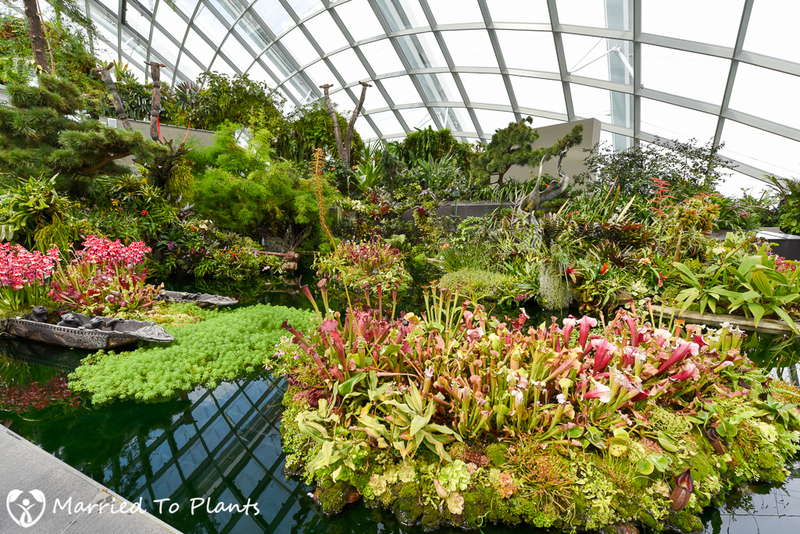 Gardens by the Bay is still expanding. 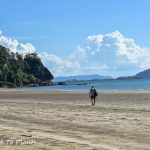 Just another reason to go back some day soon. You considered with your perfect climate for them- a Fat plant garden? 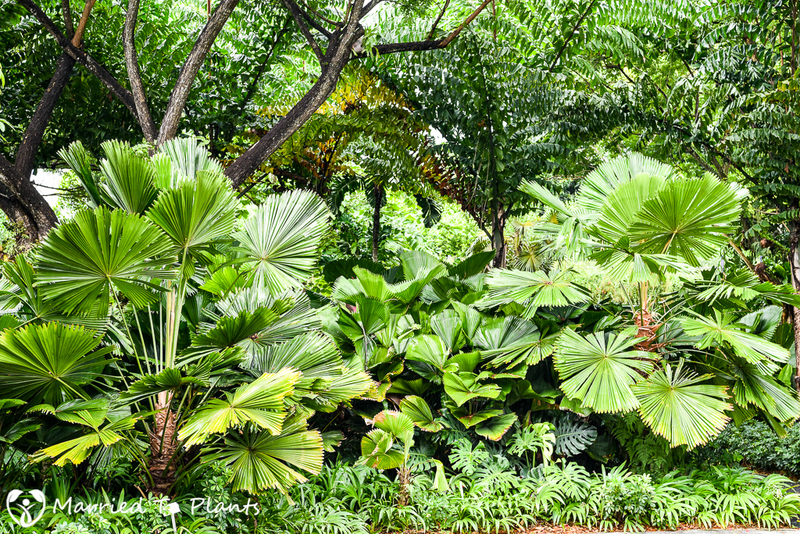 Like in Singapore you could grow Bottle Tree’s,Moringa Forest,Cyphostemma,Pachypodiums..I notice you have a steep slope at the property line- PERFECT for those plants. Uncarina!..love them. Not really. I like them in other people’s gardens though.